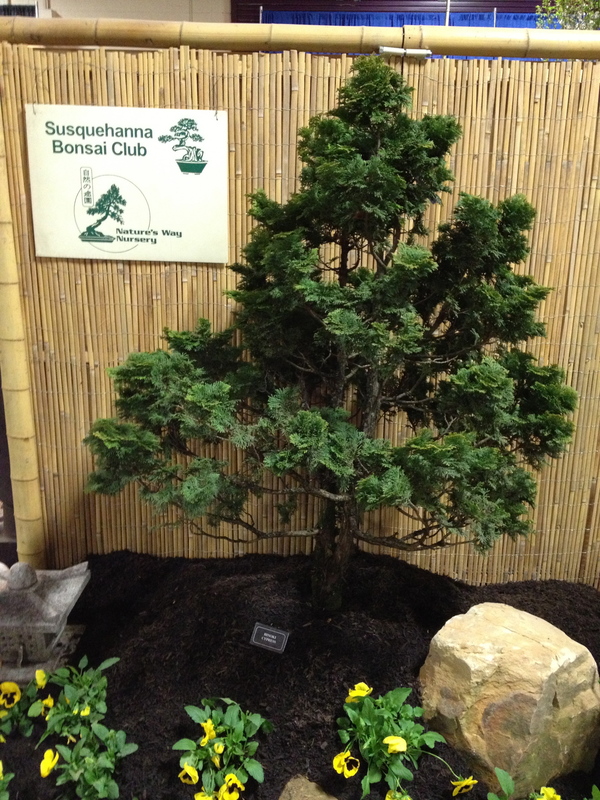 Every year the Susquehanna Bonsai Club displays several club members bonsai in an excellent setting during the Pennsylvania Home-Garden Show. 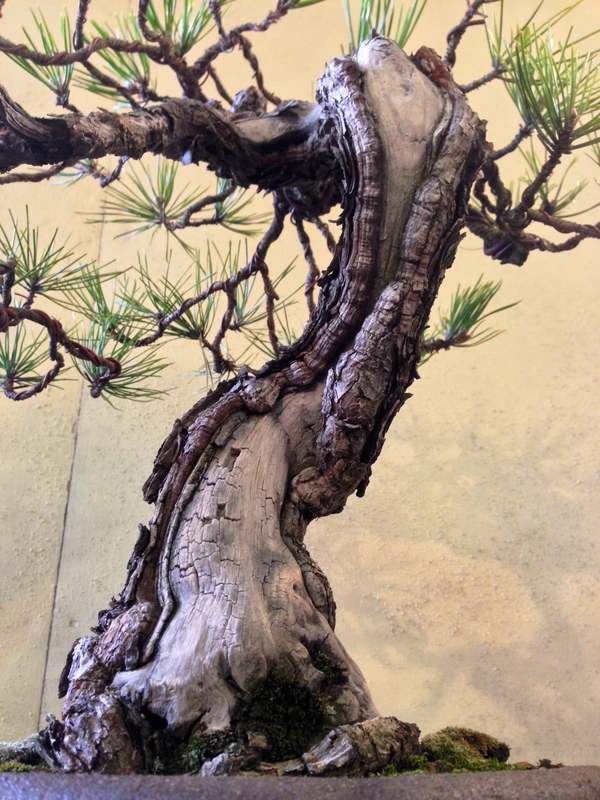 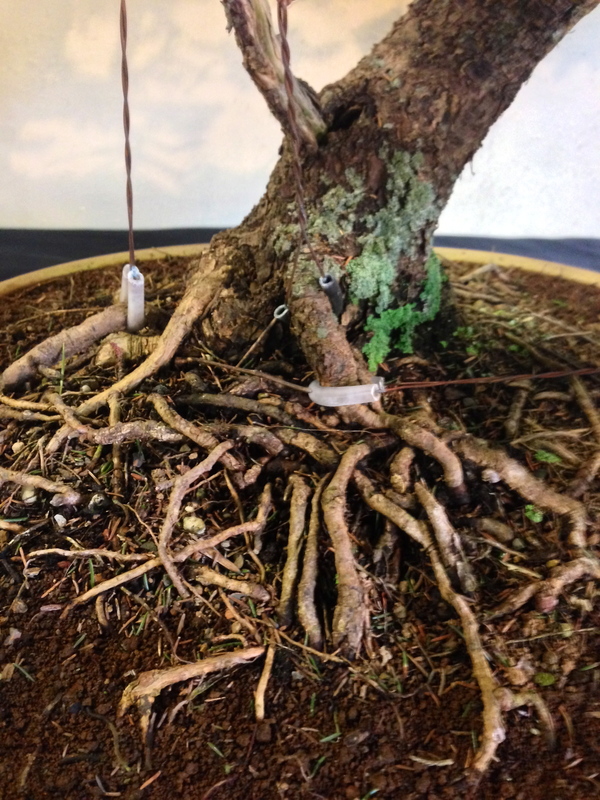 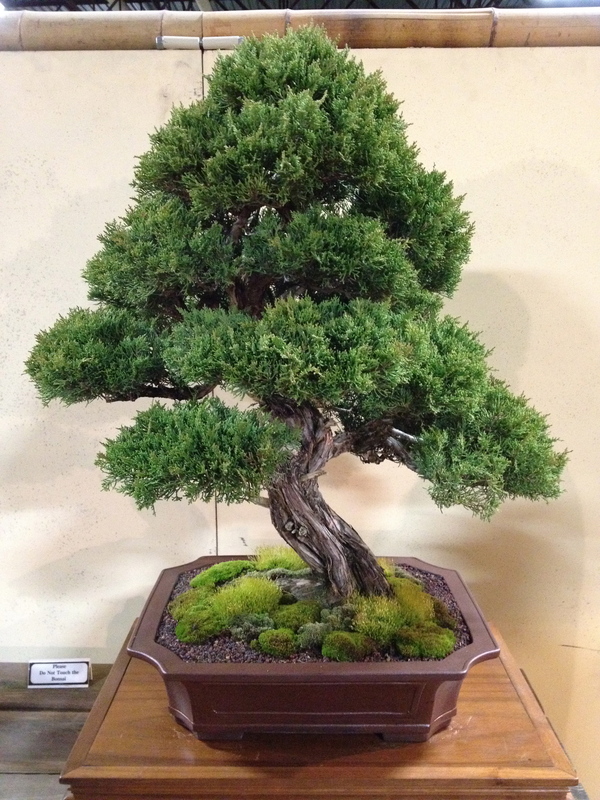 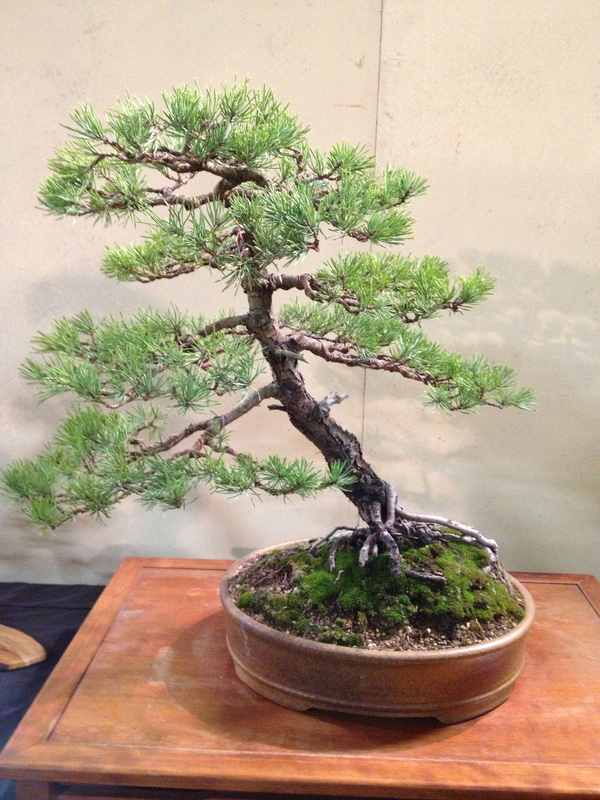 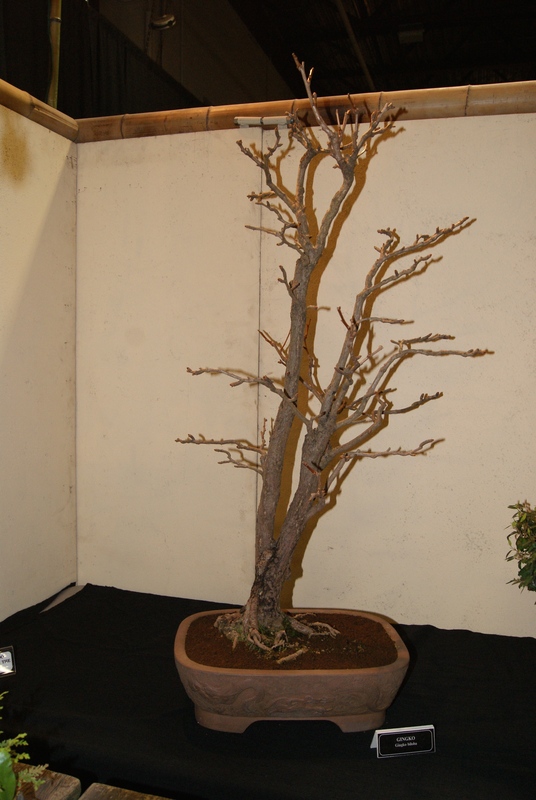 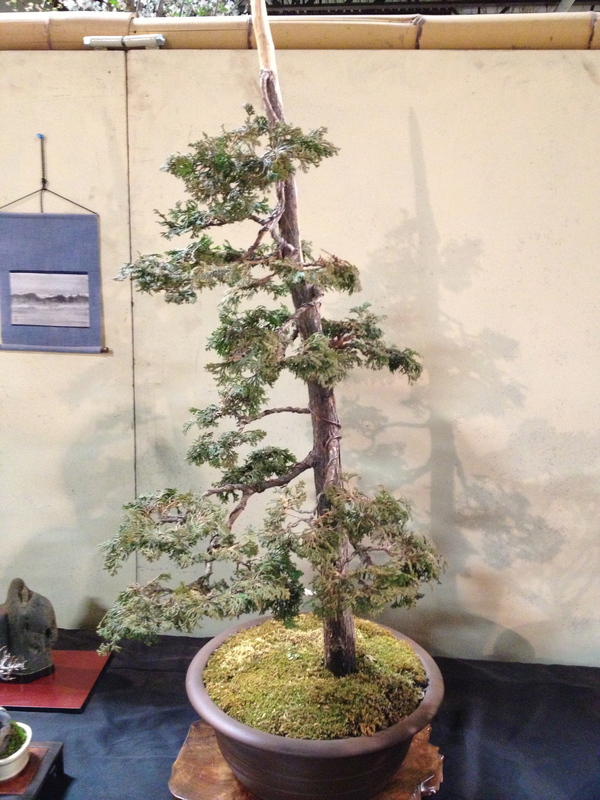 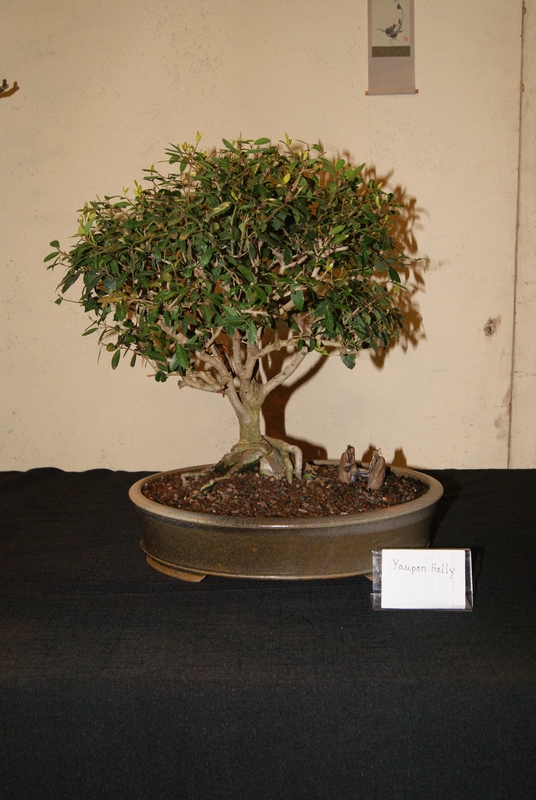 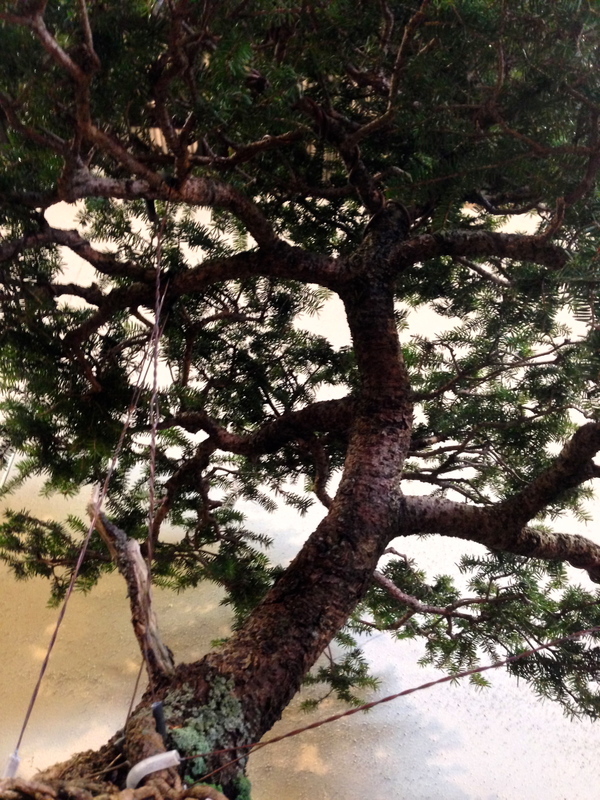 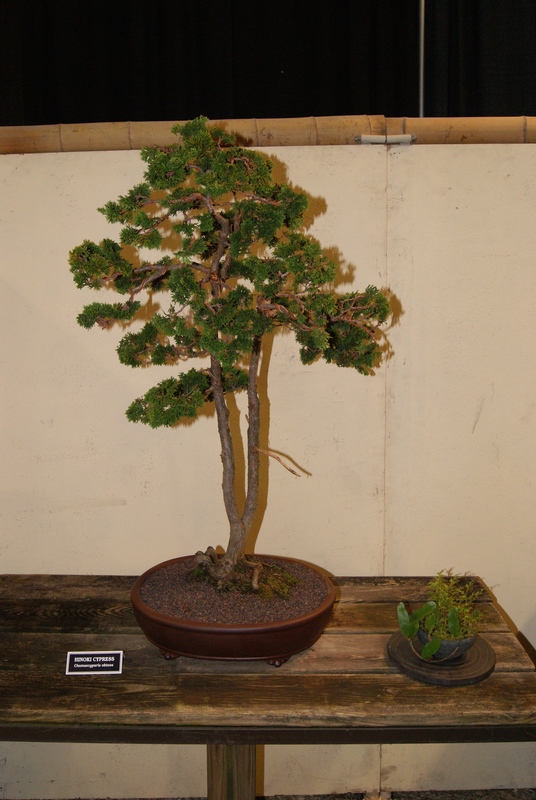 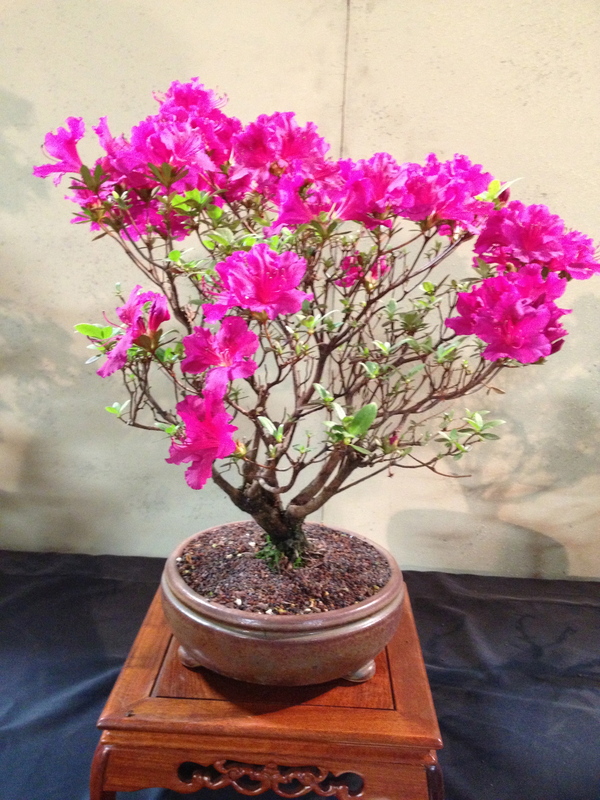 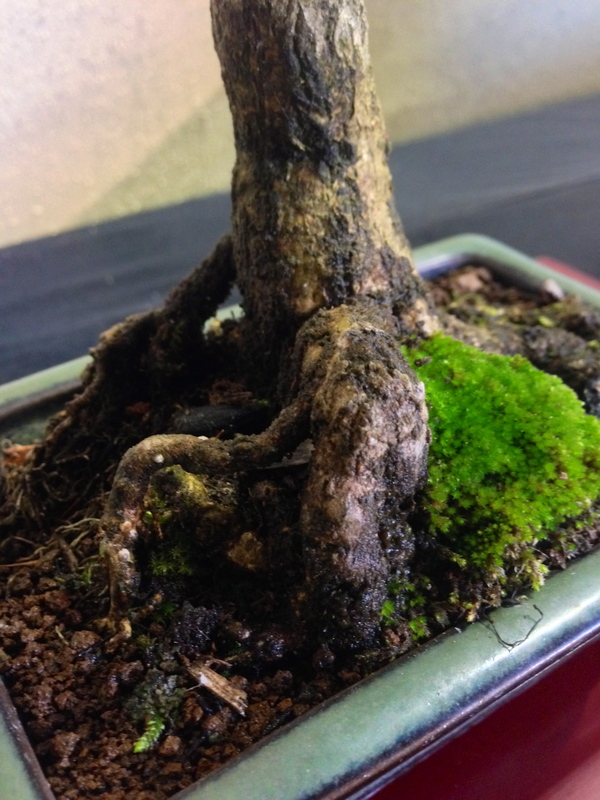 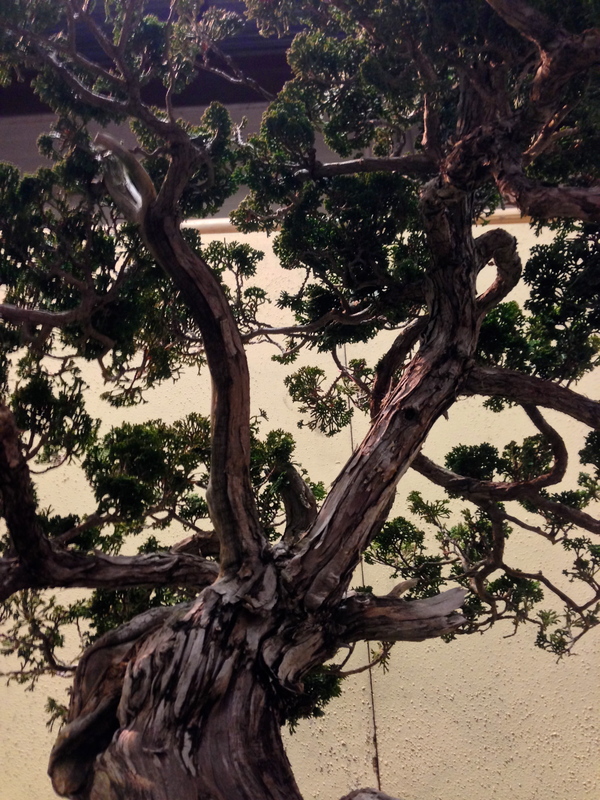 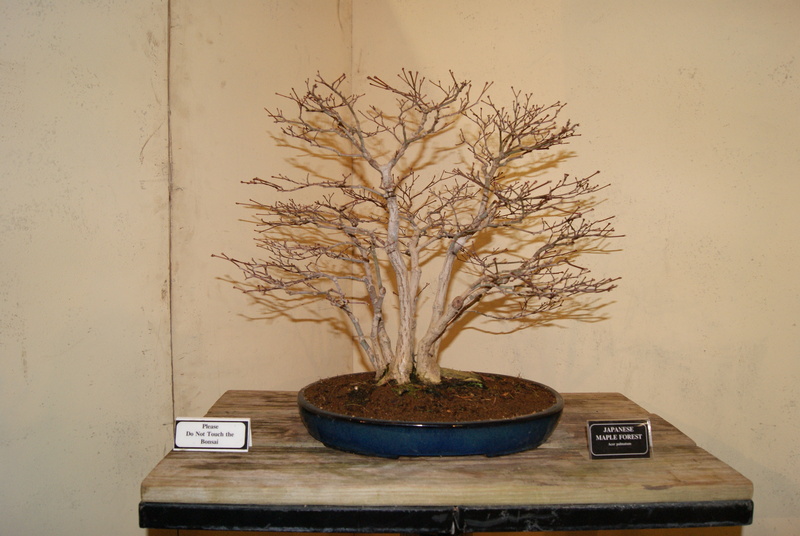 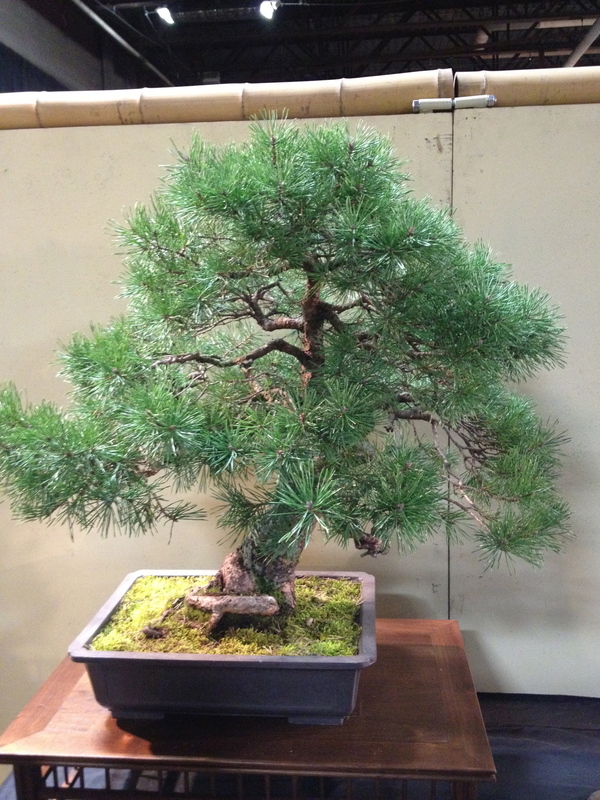 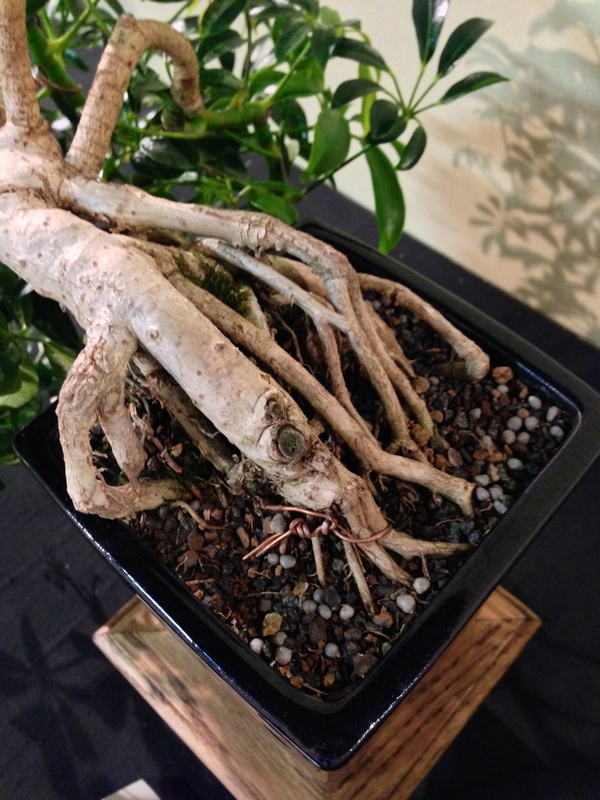 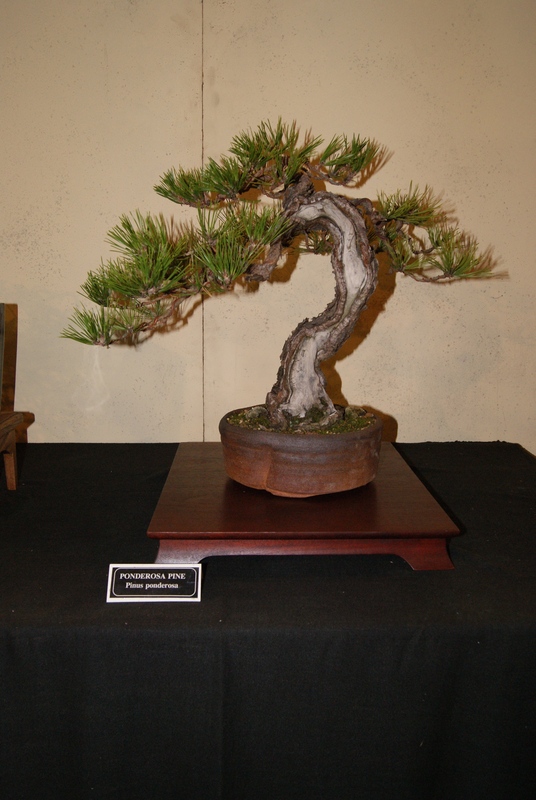 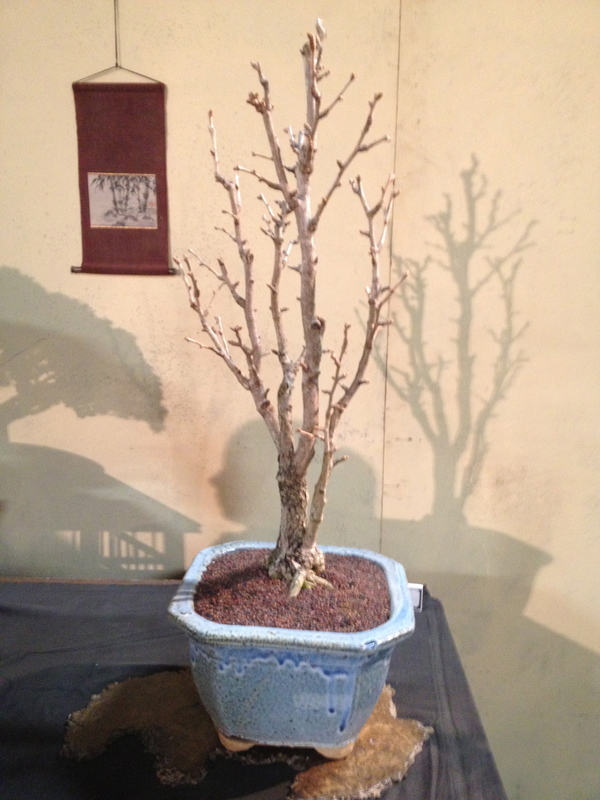 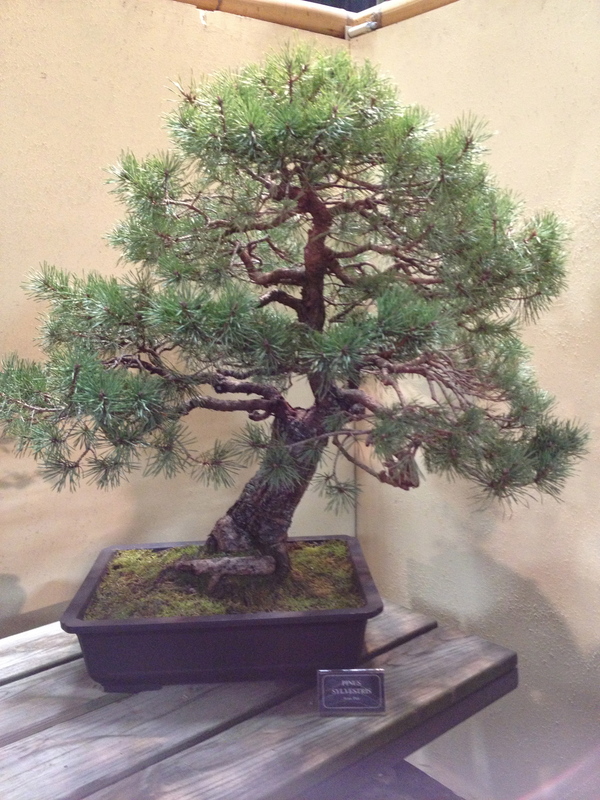 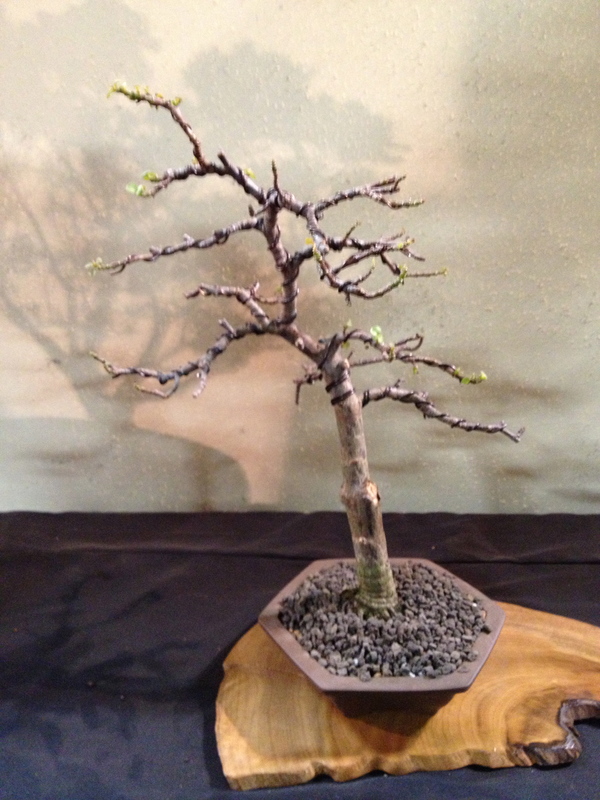 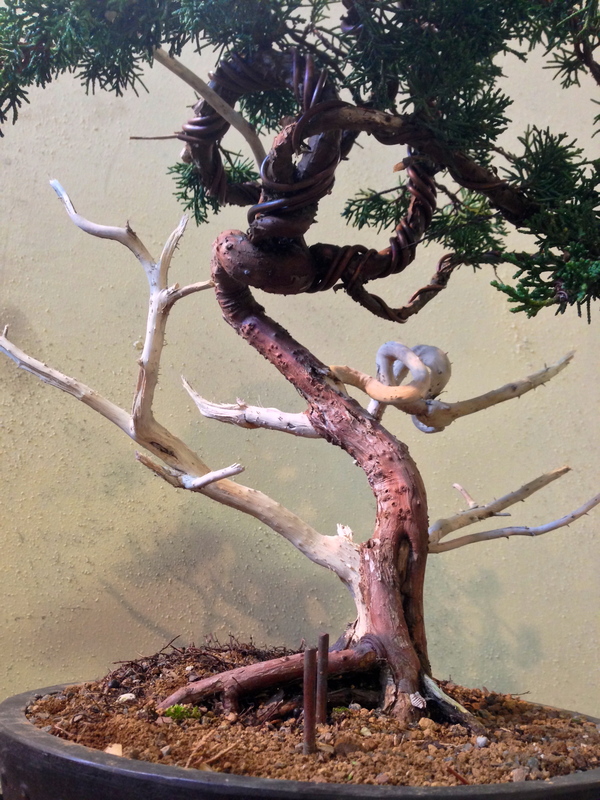 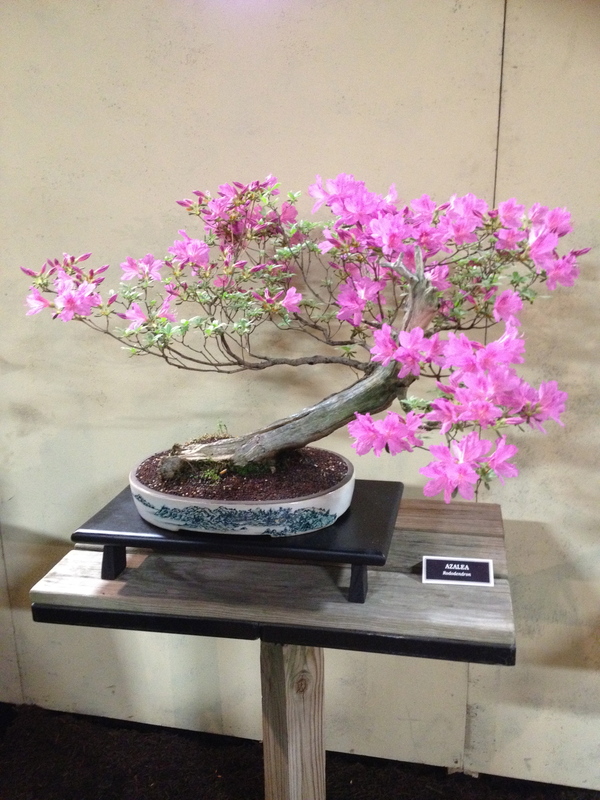 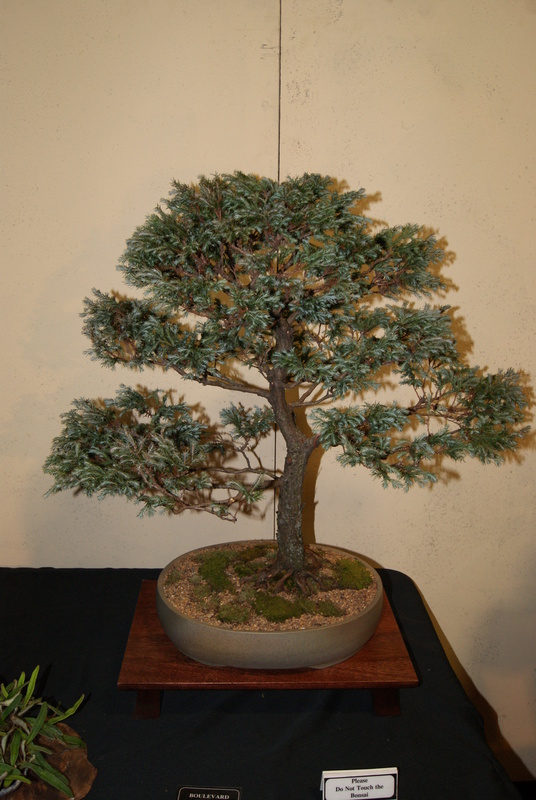 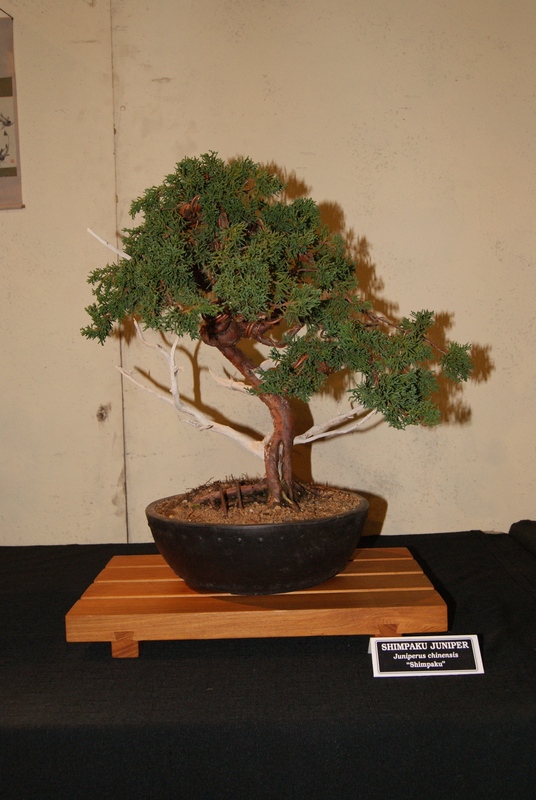 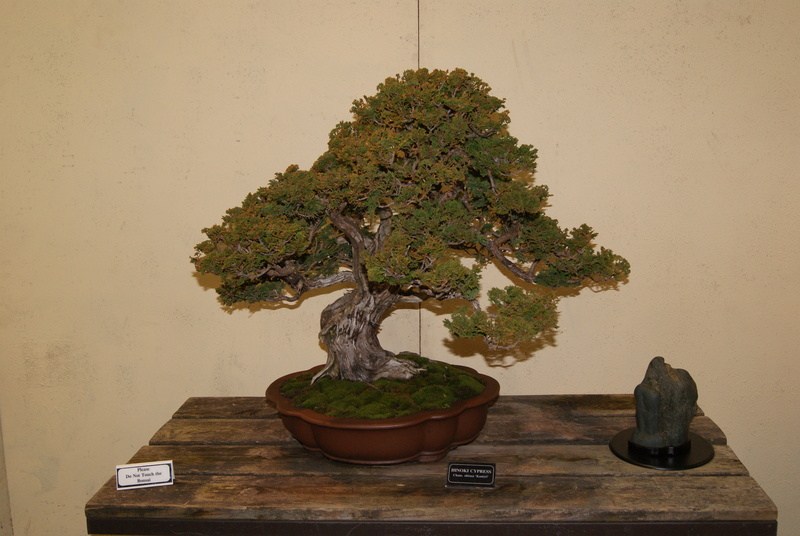 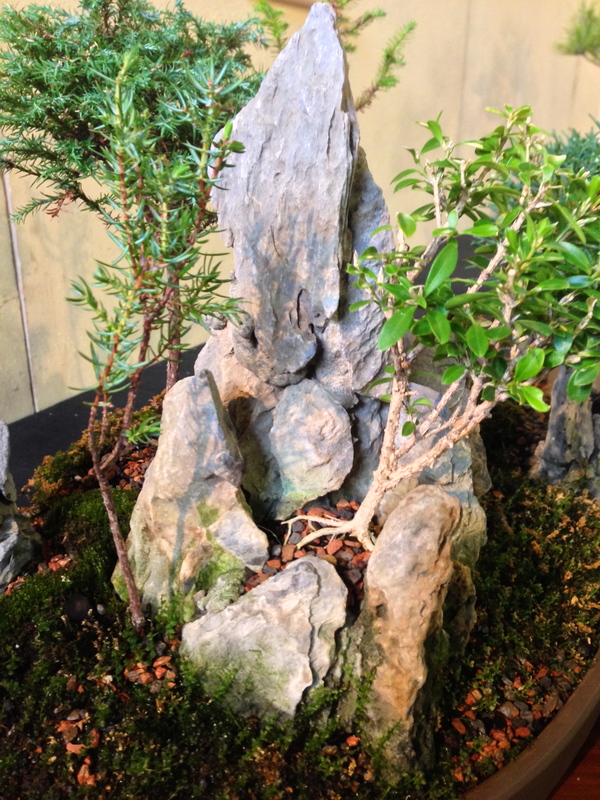 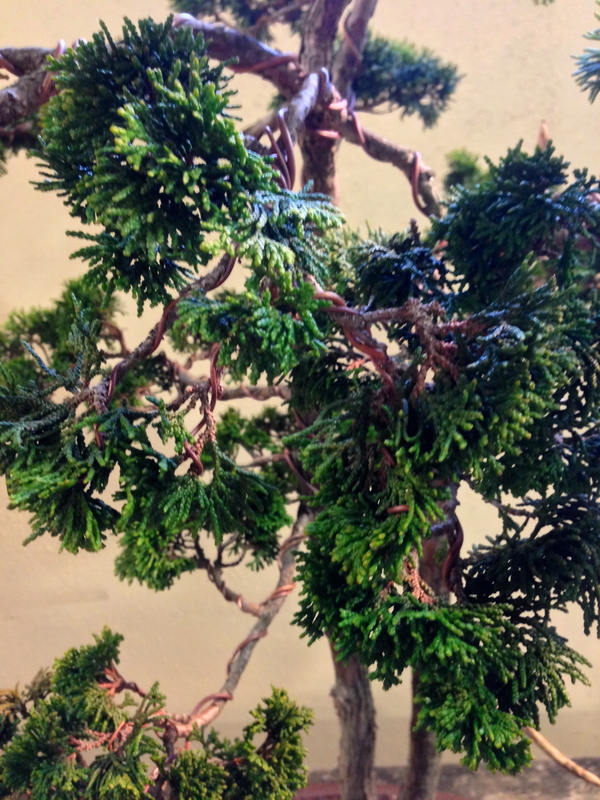 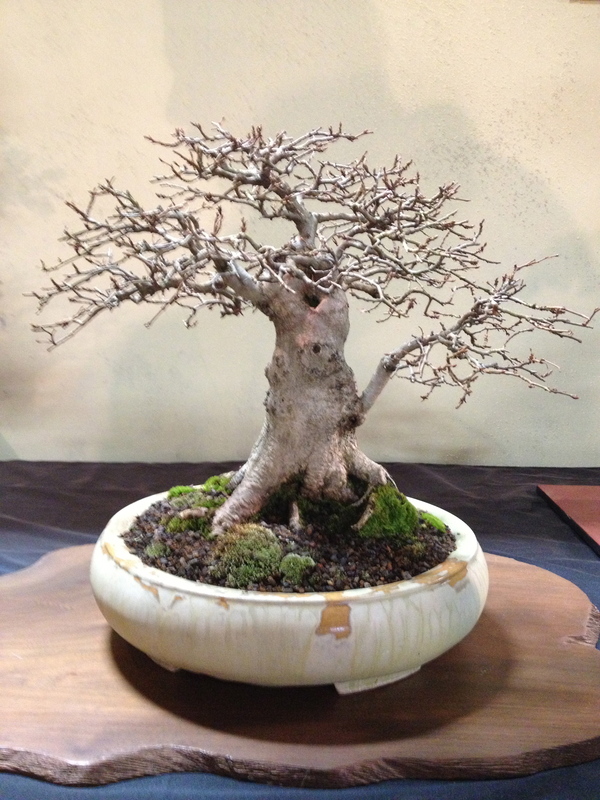 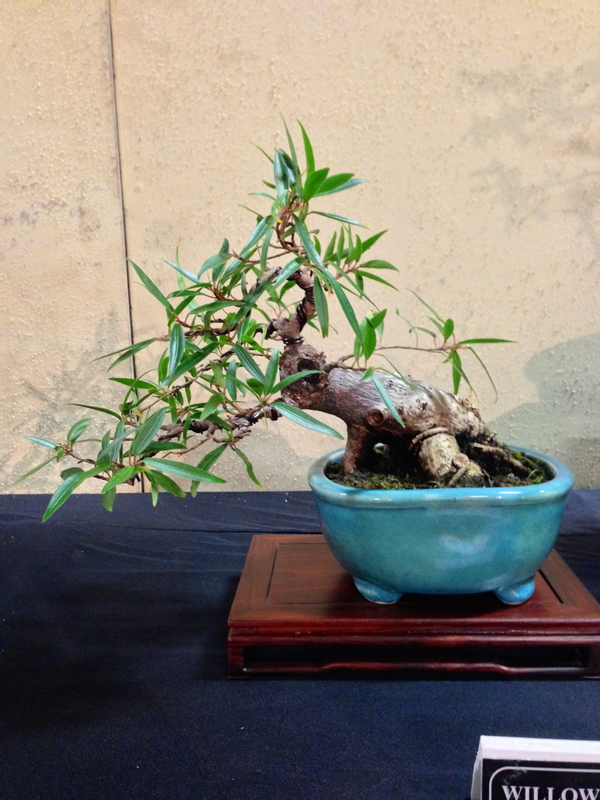 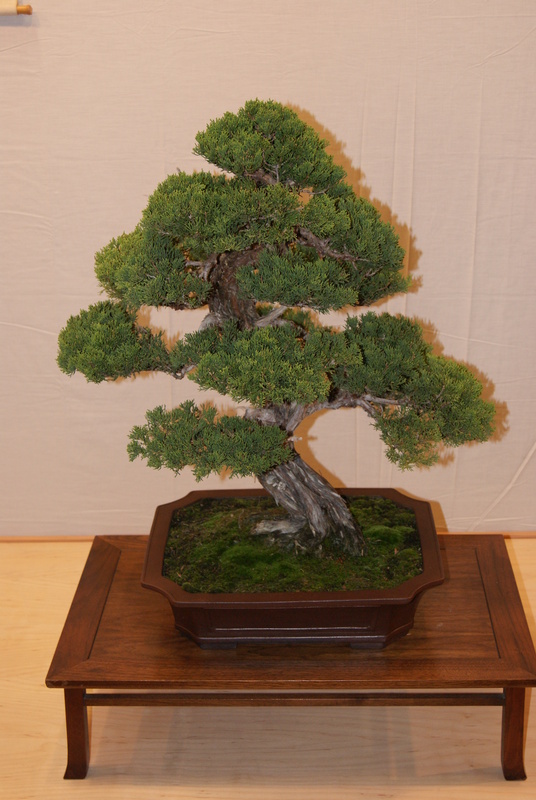 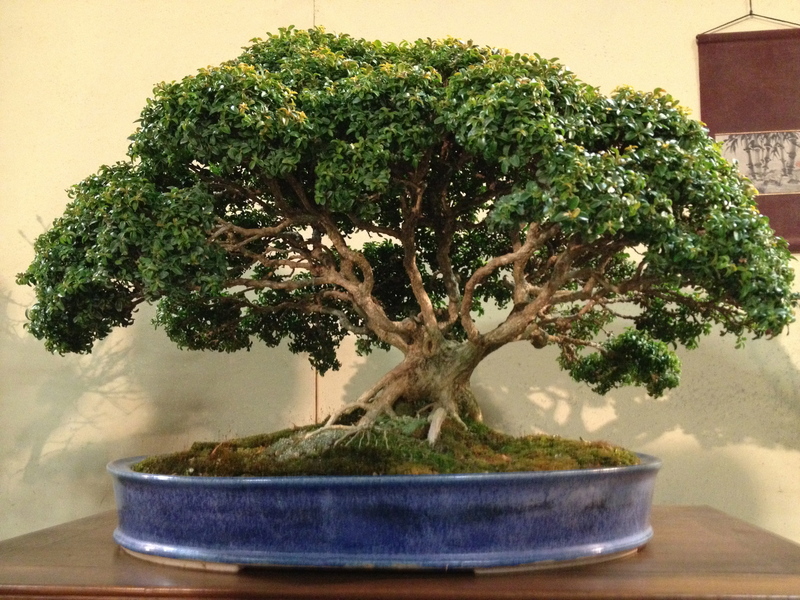 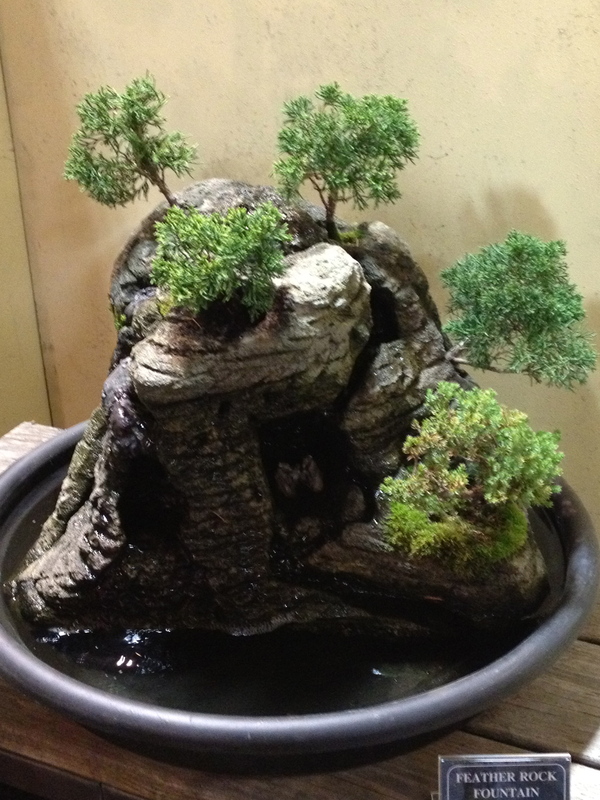 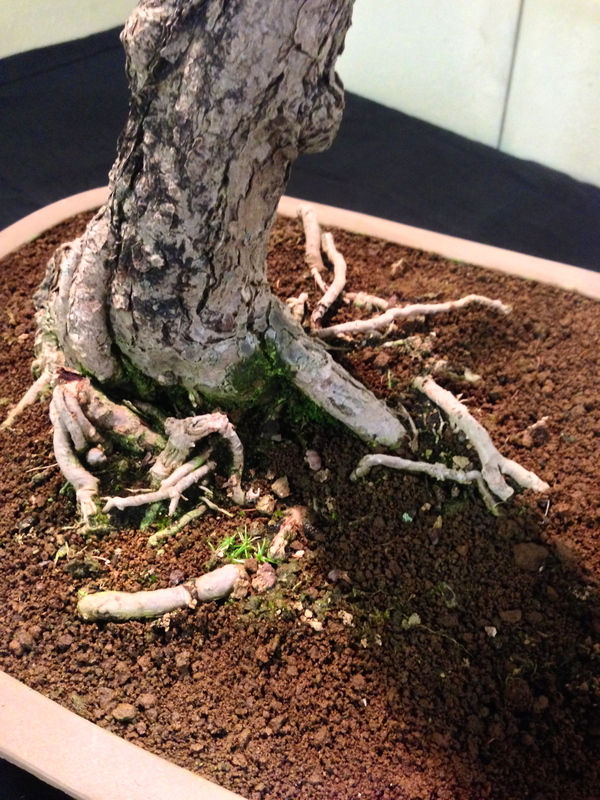 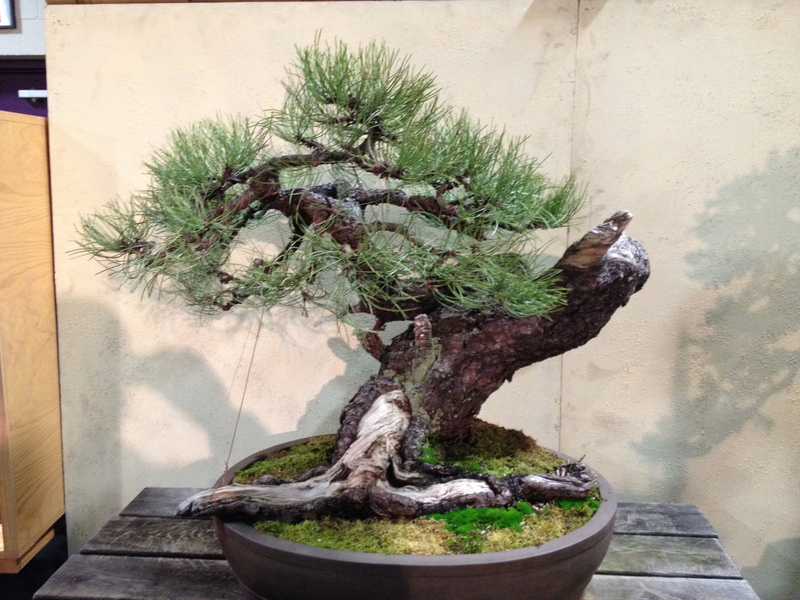 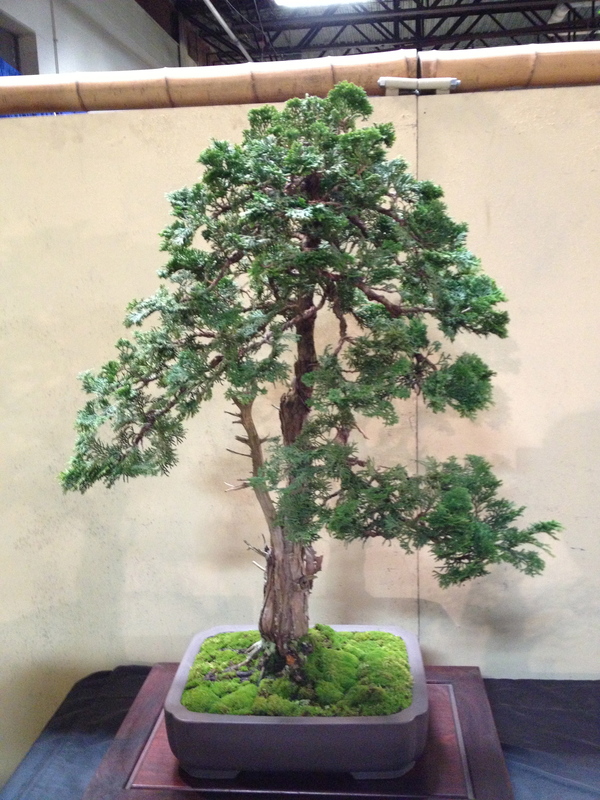 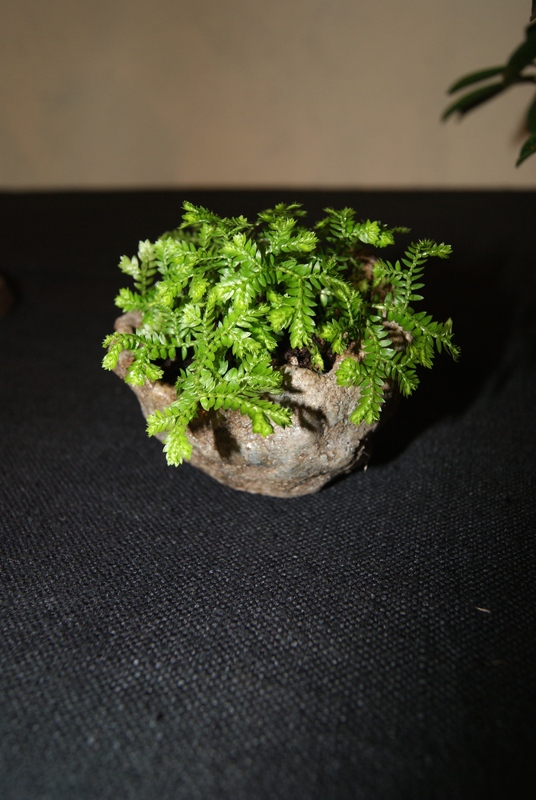 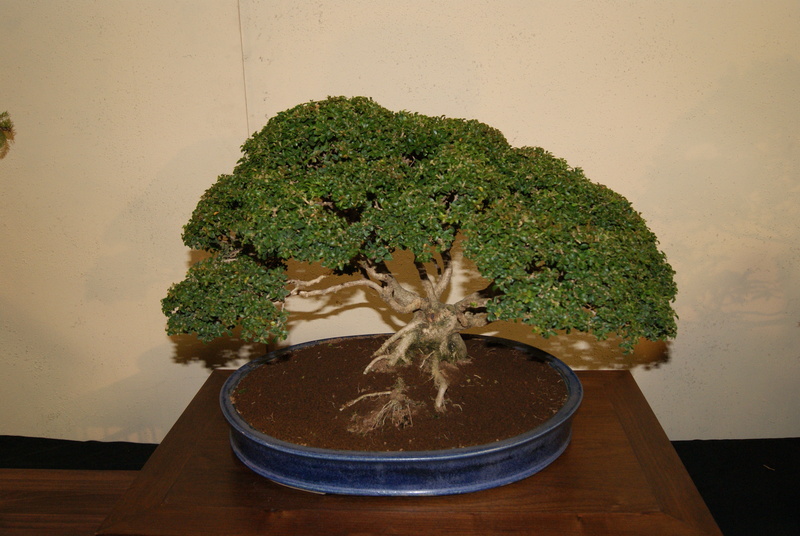 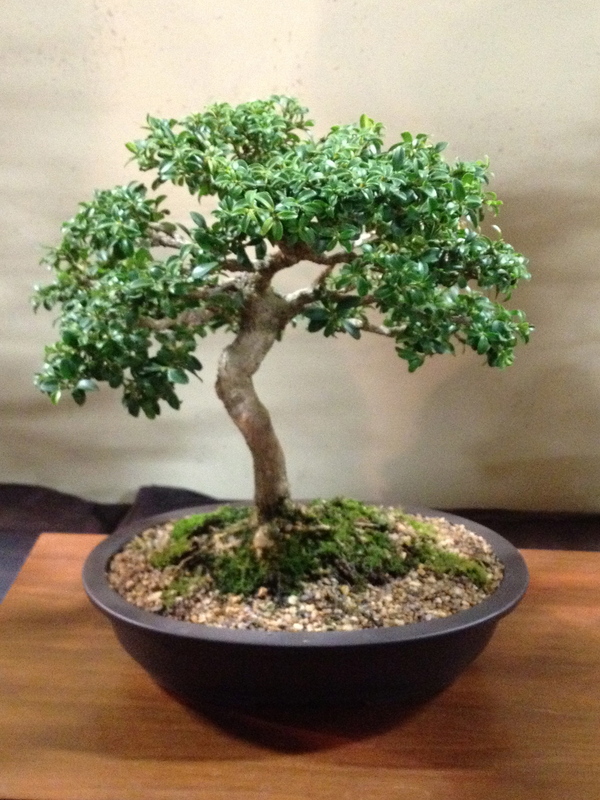 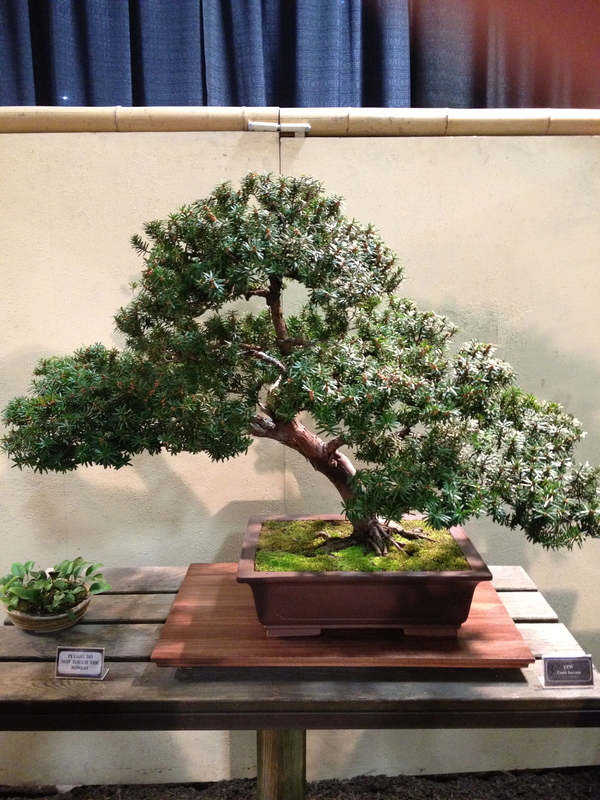 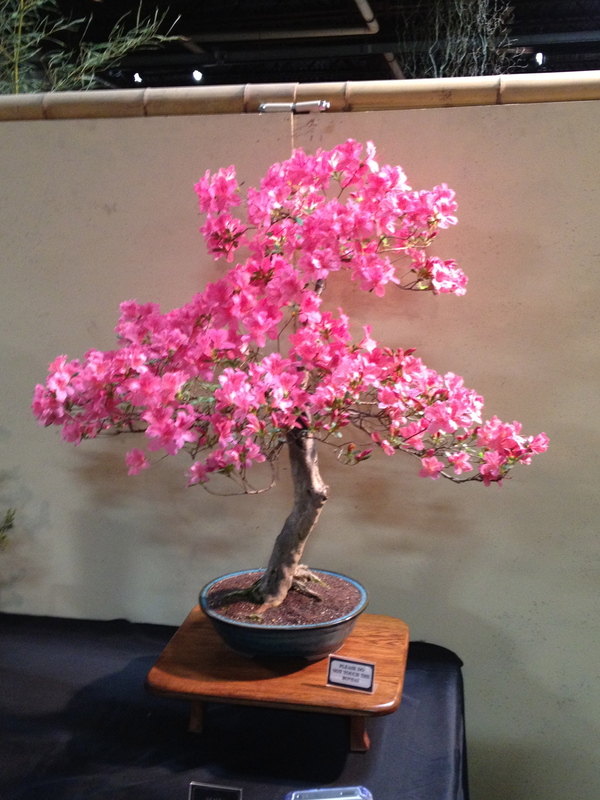 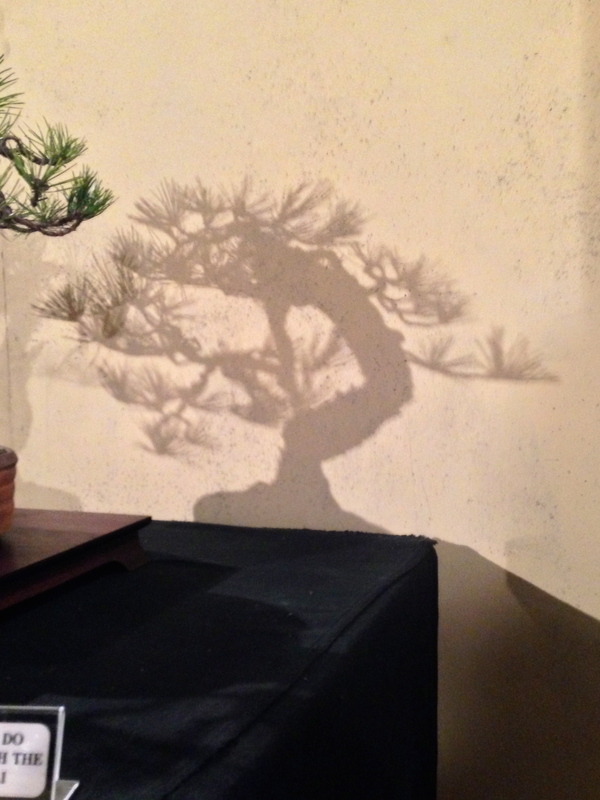 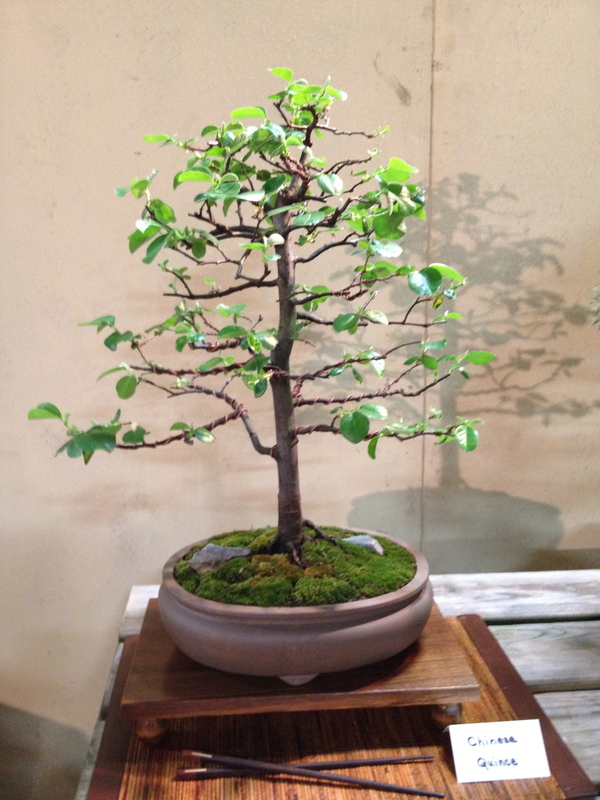 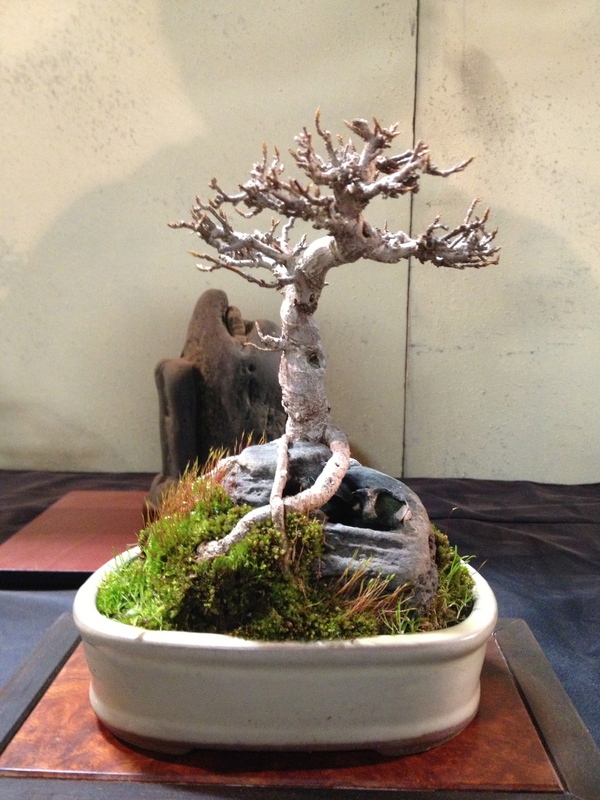 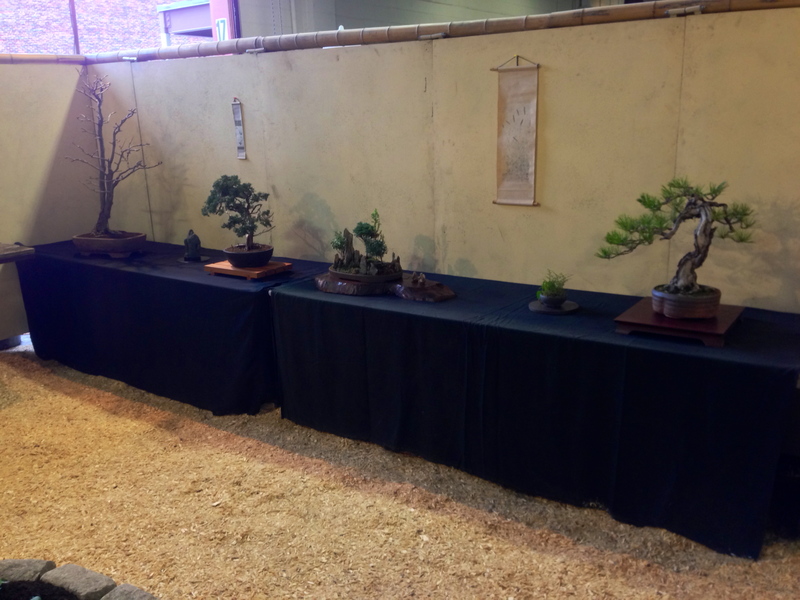 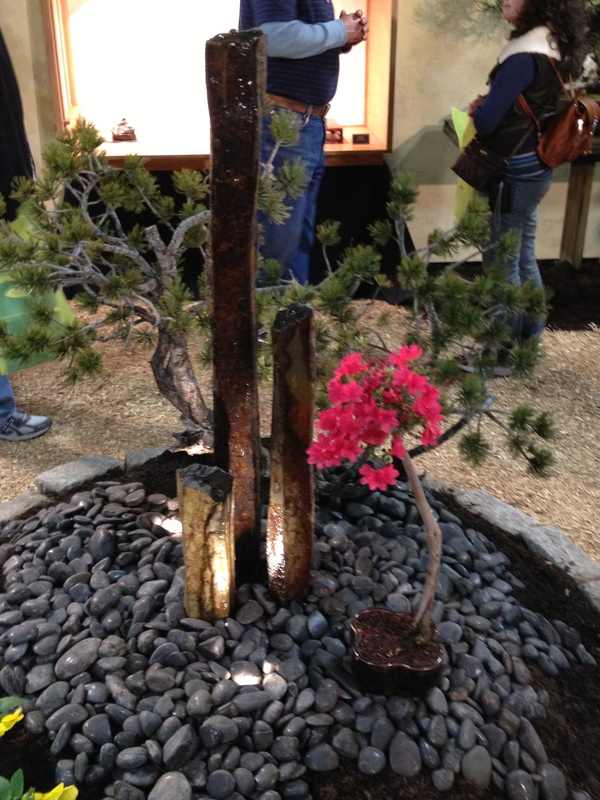 Well it’s that time of year again and as always the Susquehanna Bonsai Club put on an excellent display of bonsai trees at the 2014 Pennsylvania Garden Expo in Harrisburg, Pa.. 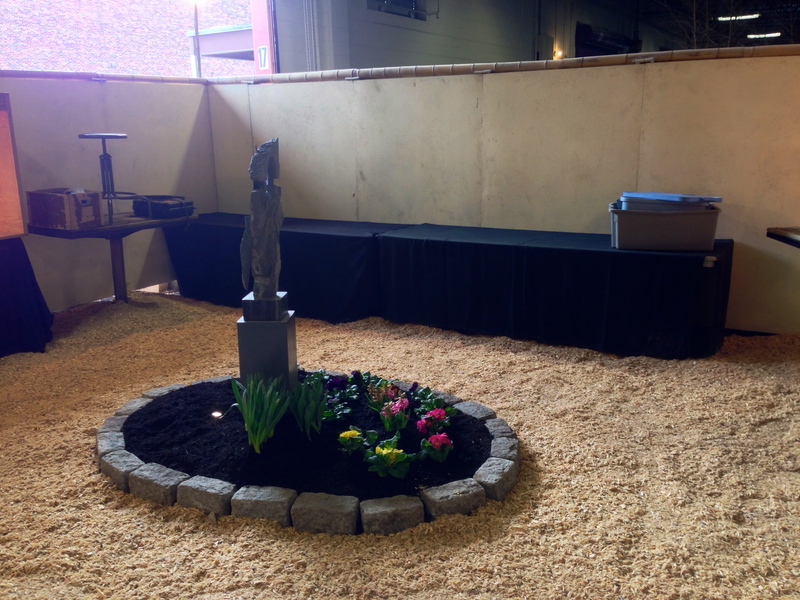 The following few photos are showing the set-up process of the club’s display area. 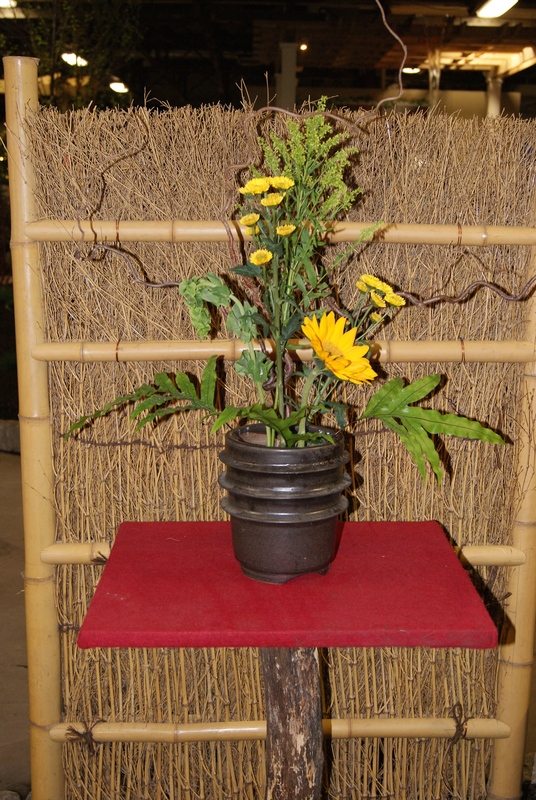 It was a 2 day set-up and unfortunately I do not have any 1st day photos so below are all from the 2nd day. 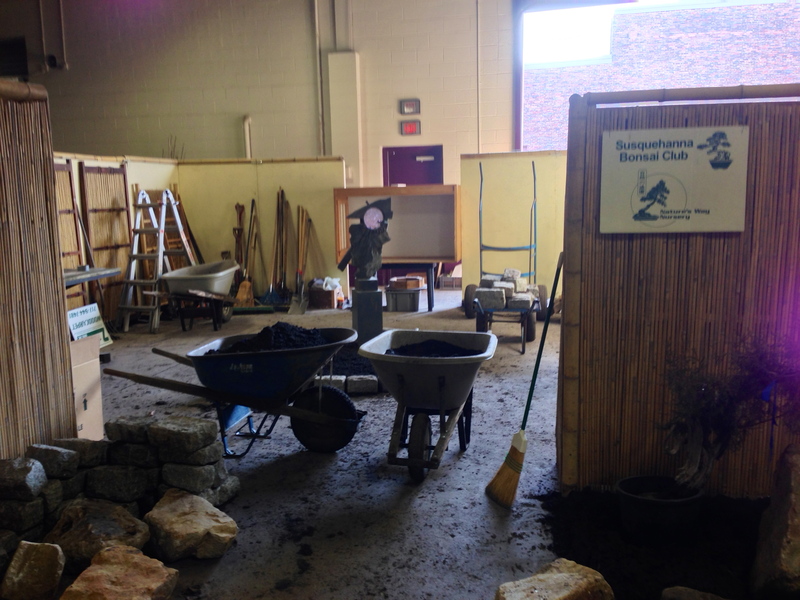 All the walls are up and let the landscaping begin! 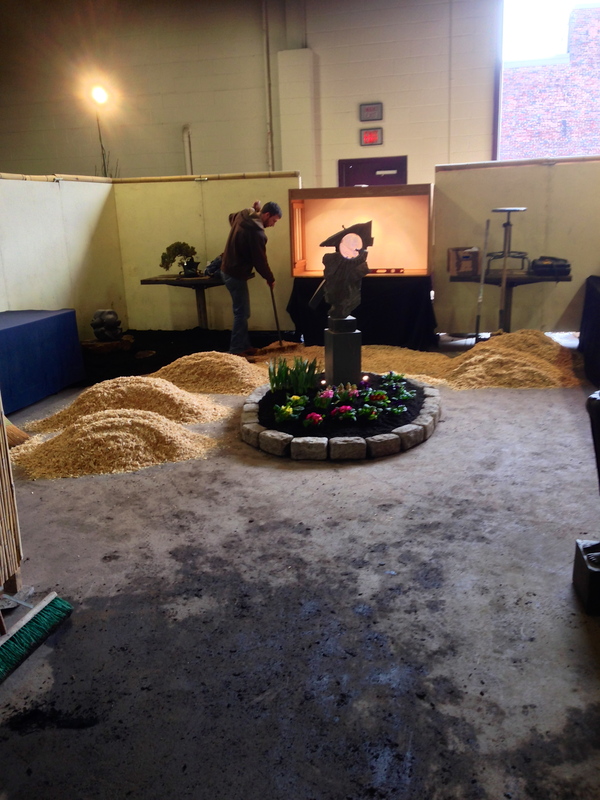 Looks like a lot of work needing to be done with the show starting the following day. 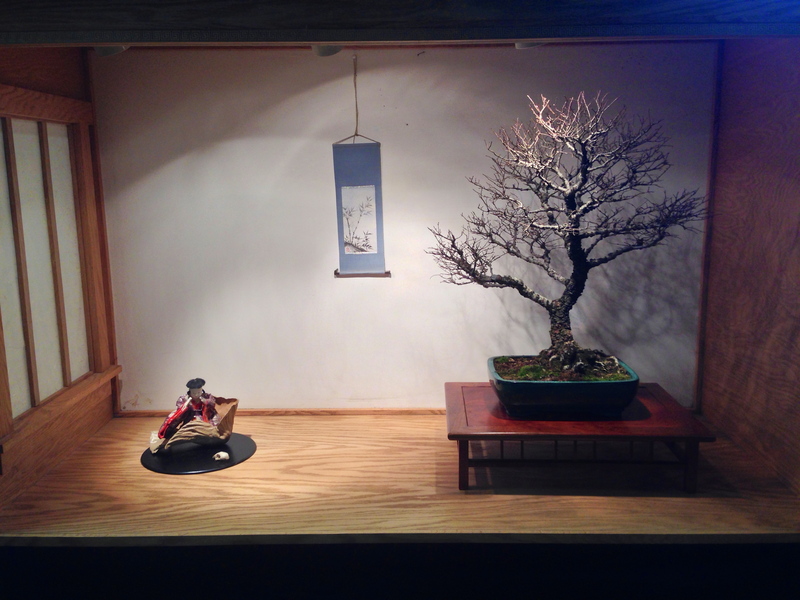 Empty tokonoma at the moment. 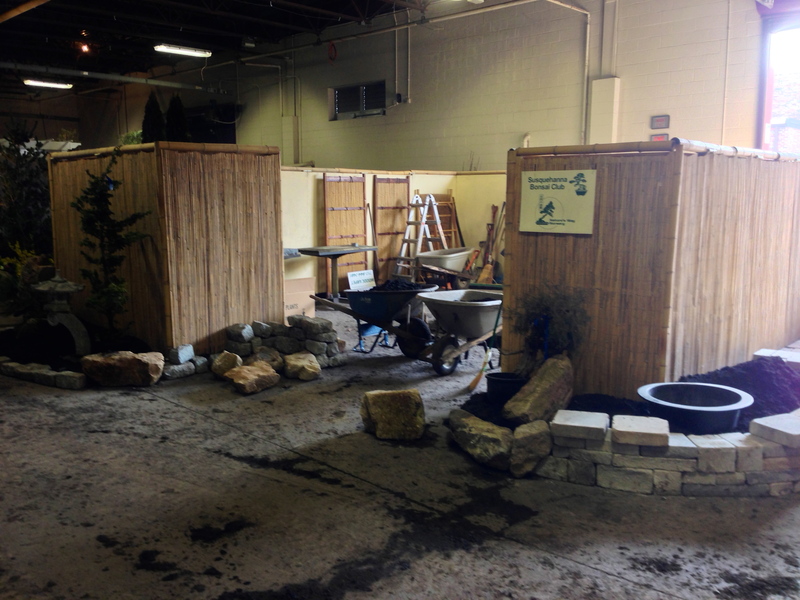 Entrance display coming along nicely. 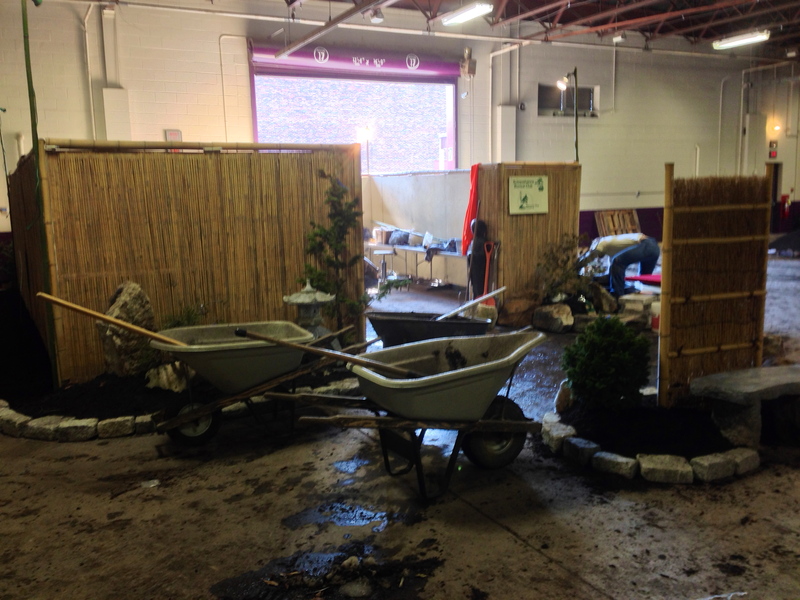 A lot of material moved around in all those wheelbarrows. 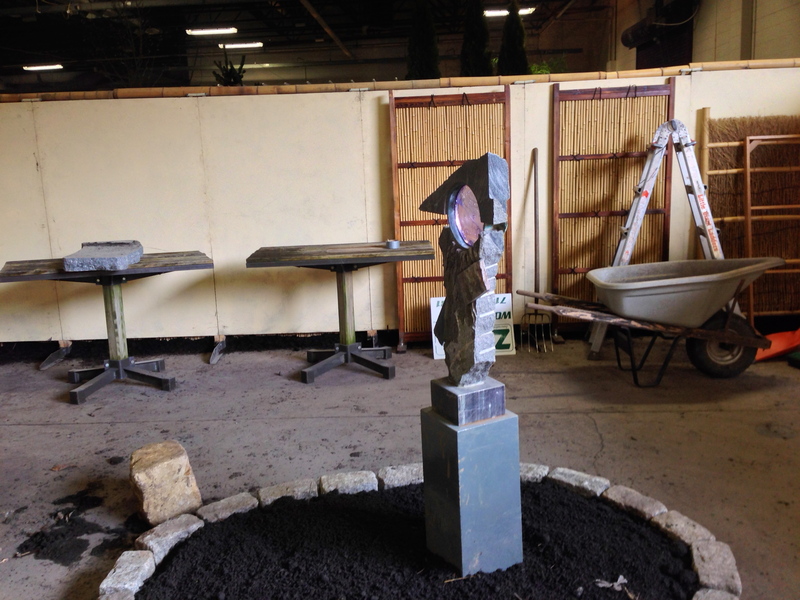 Center display with sculpture getting set-up. 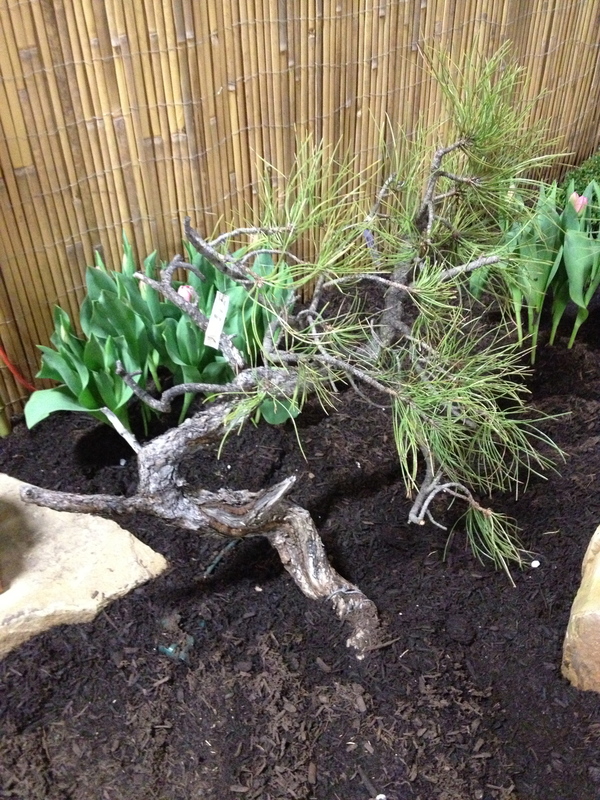 Looking nice after some flowers and mulch. 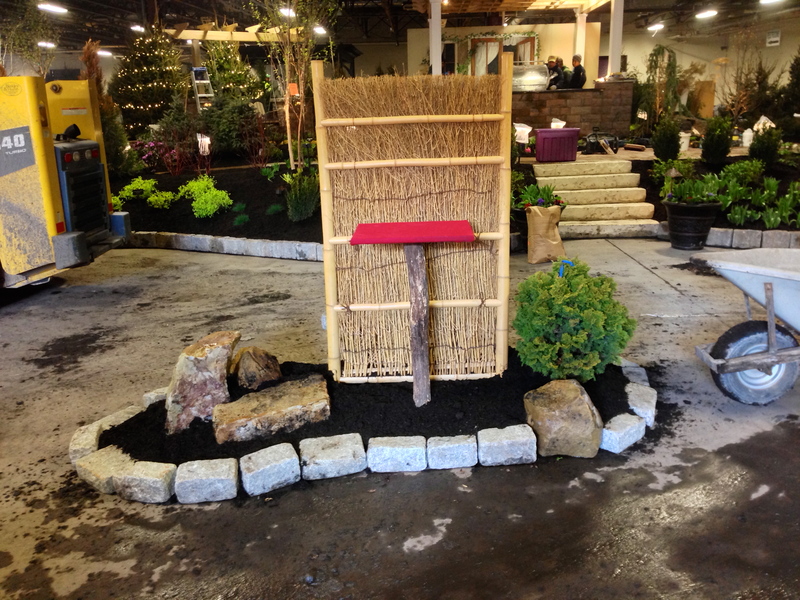 New member to the club Mika, who also was in charge and worked with his crew on the nice hardscaping work and patio created on the side of our display. 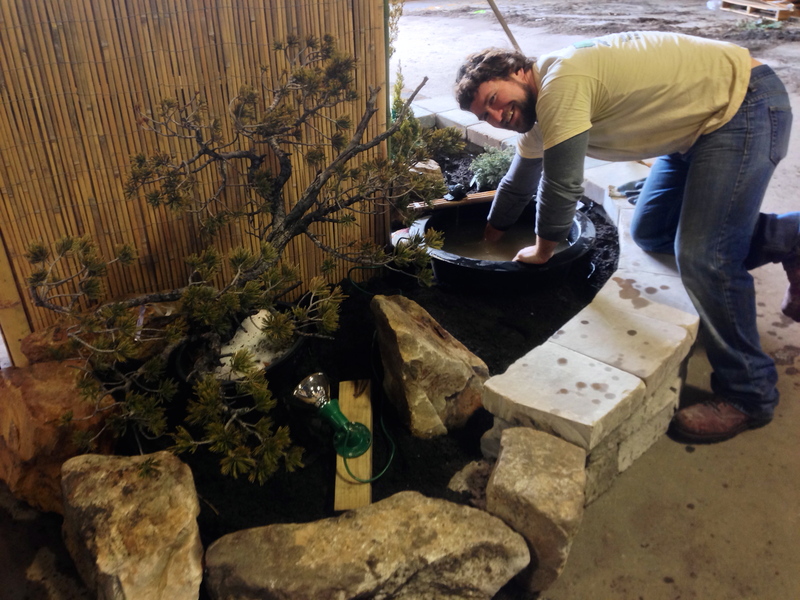 Here he is finishing up installing the little pond we had. 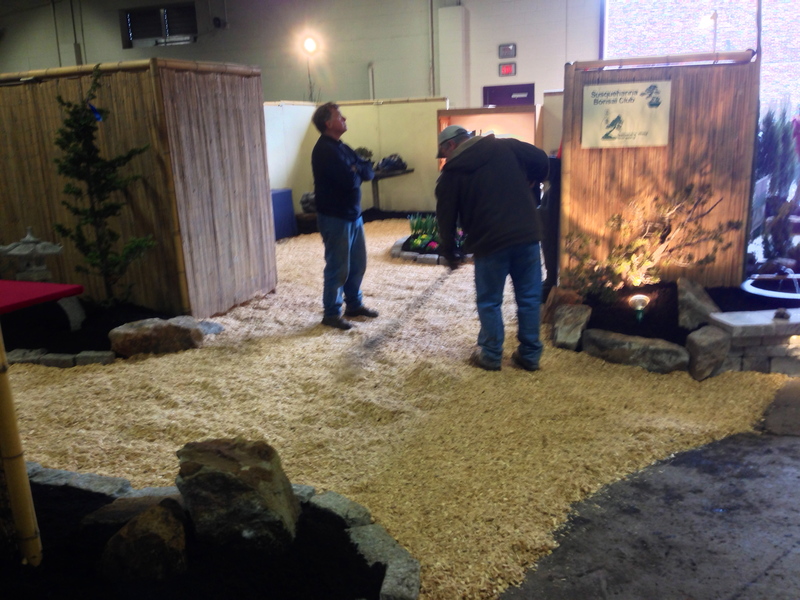 Center island completed, tables in place so its time to start spreading the natural mulch to create a nice pathway around the display. 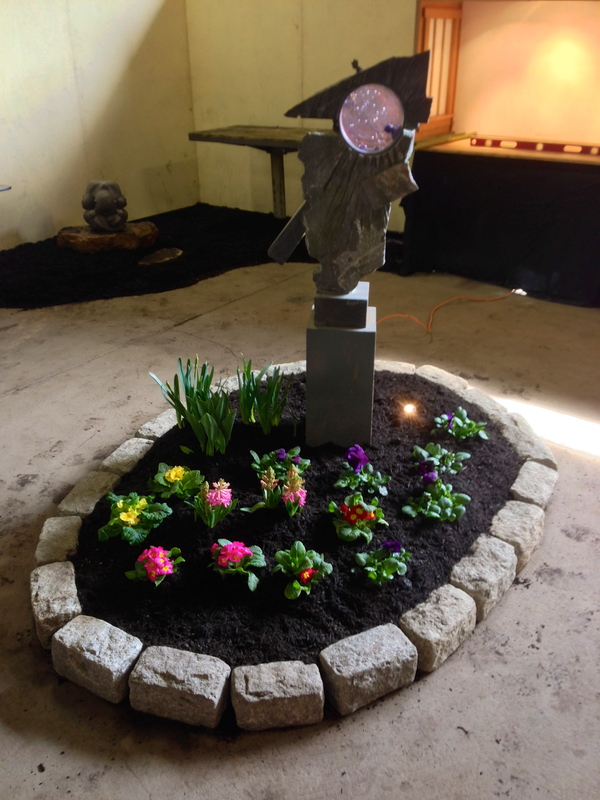 It also made it a bit nicer to walk on instead of the concrete floor. 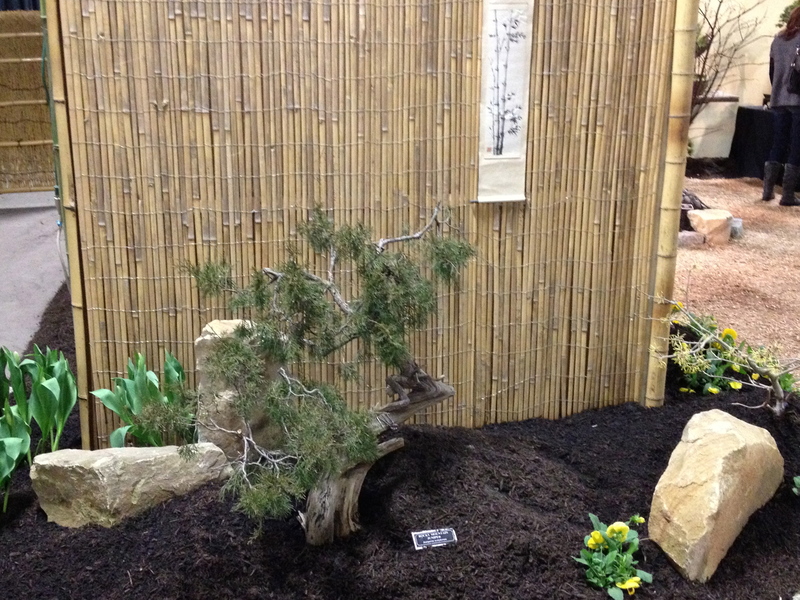 Mulch floor all spread out and getting ready to start setting up the bonsai! 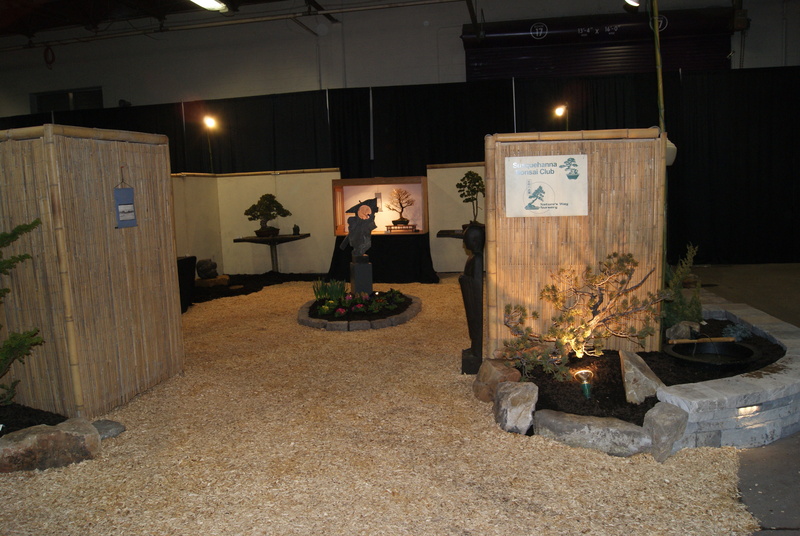 The next several photos are of our completed display just moments before the crowds were let in and the show started. 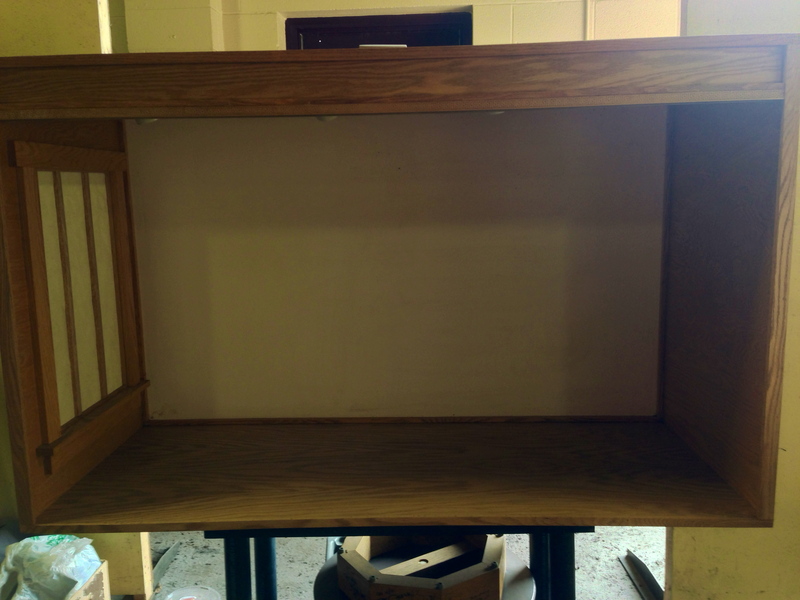 A spectators view looking in. 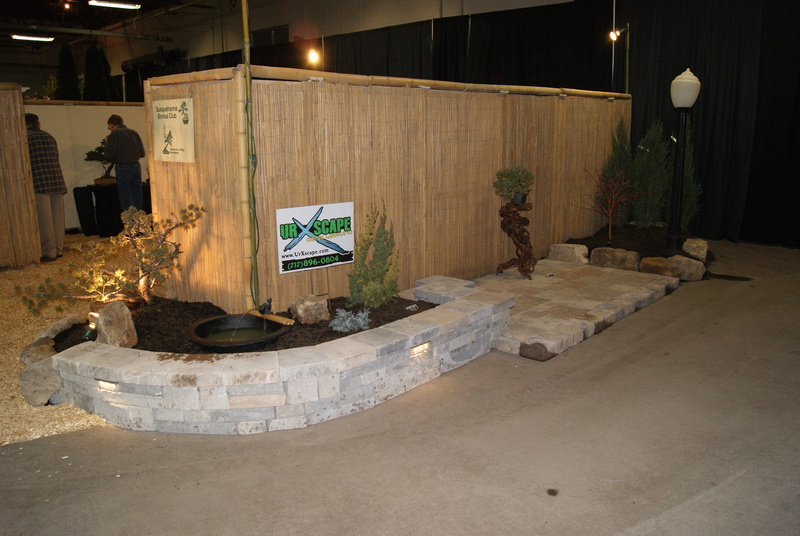 The hardscape wall and patio on the outside adding some modern class to our display. 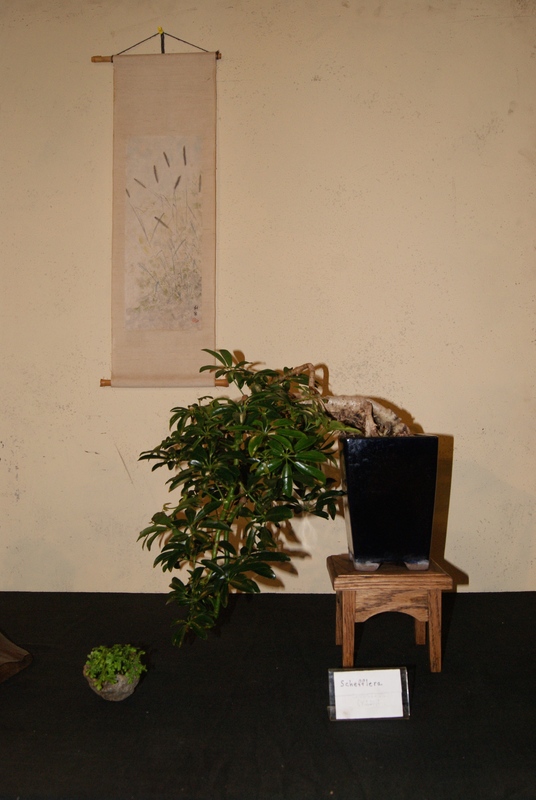 The entrance display with a very lovely ikebana to greet all visitors. 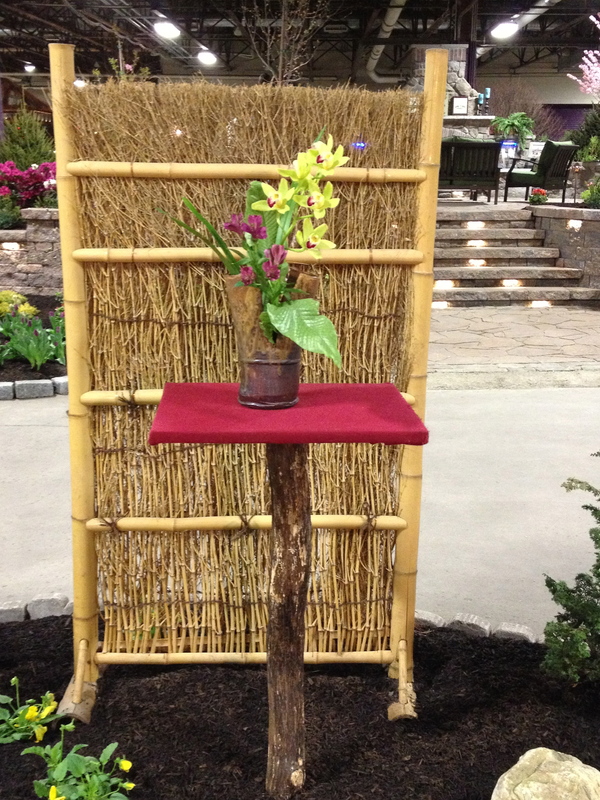 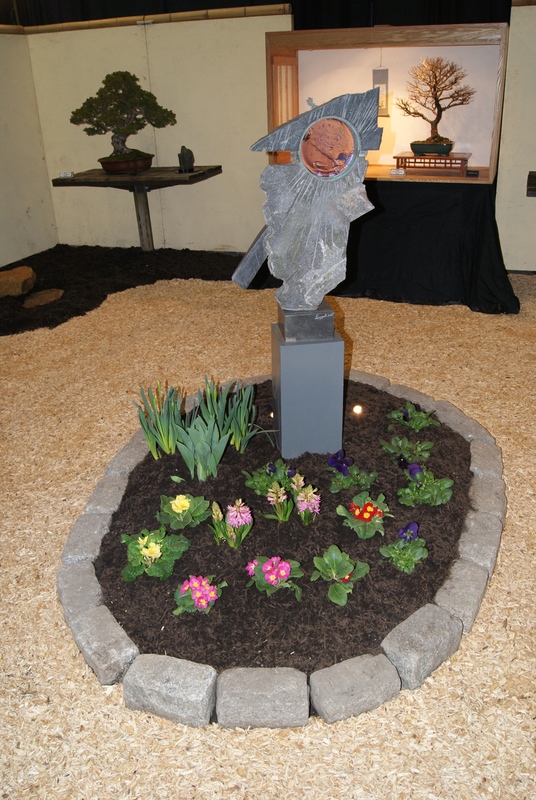 A nicely completed center island with a modern sculpture and some spring flowers. 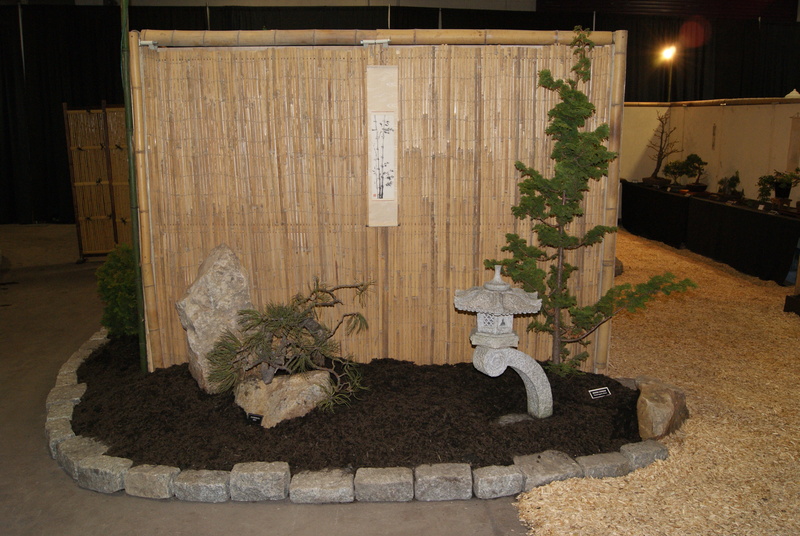 Our tokonoma display for the show. 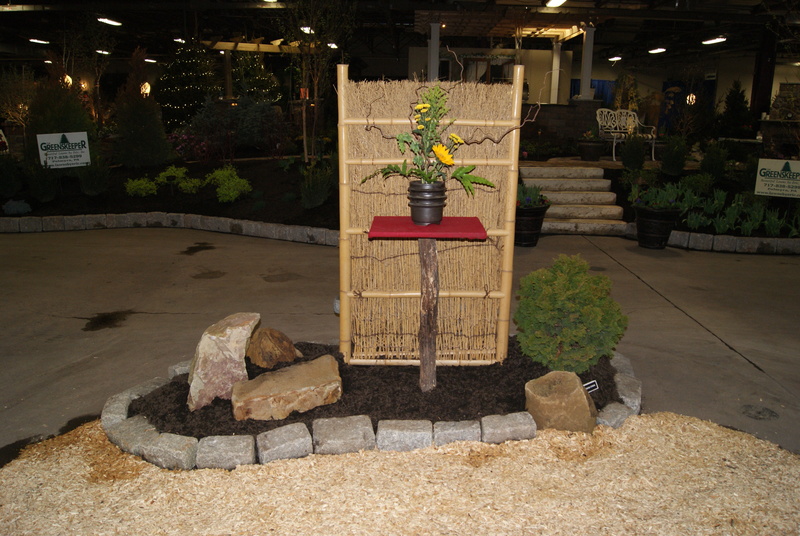 Weeping Buddha in the far left corner of our display area. 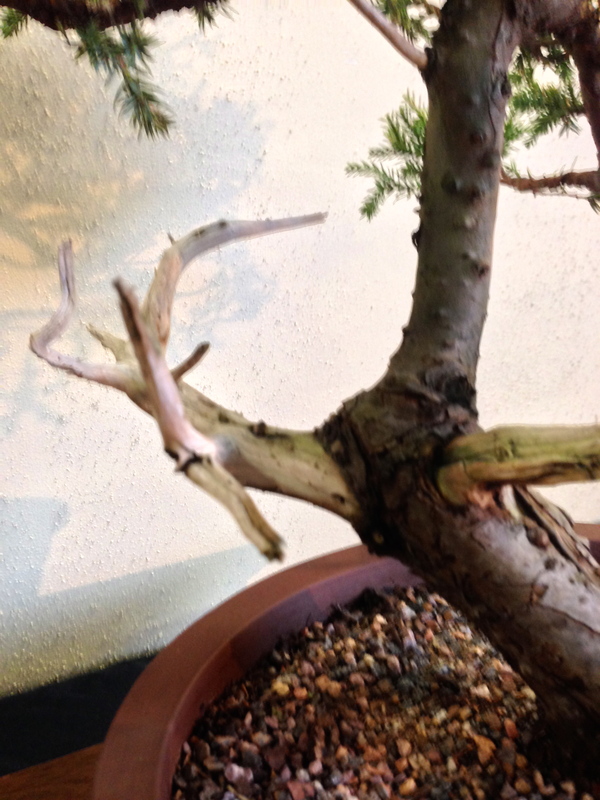 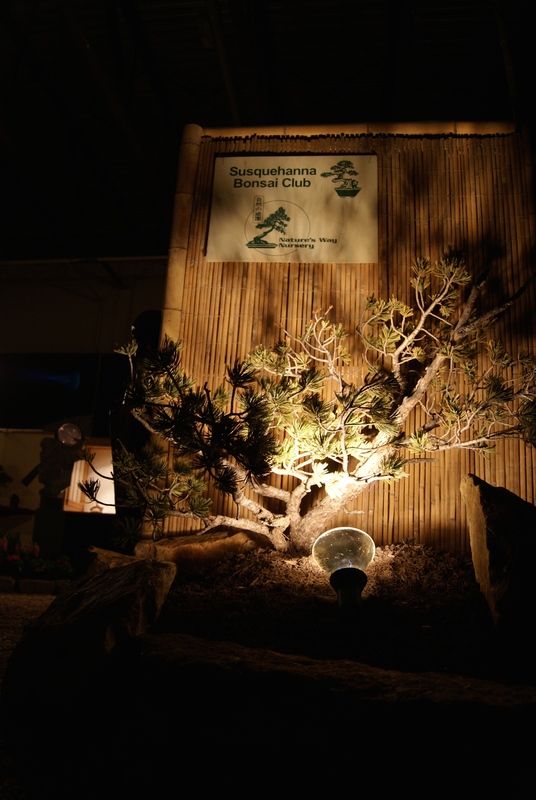 Our clubs entrance sign lighted up with a nice pre-bonsai, very old yamadori Pine (can’t remember the exact species). 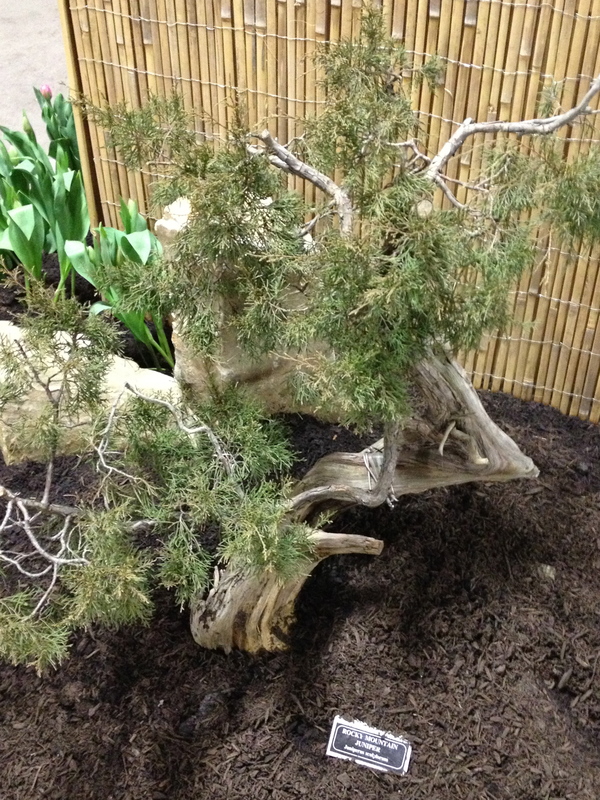 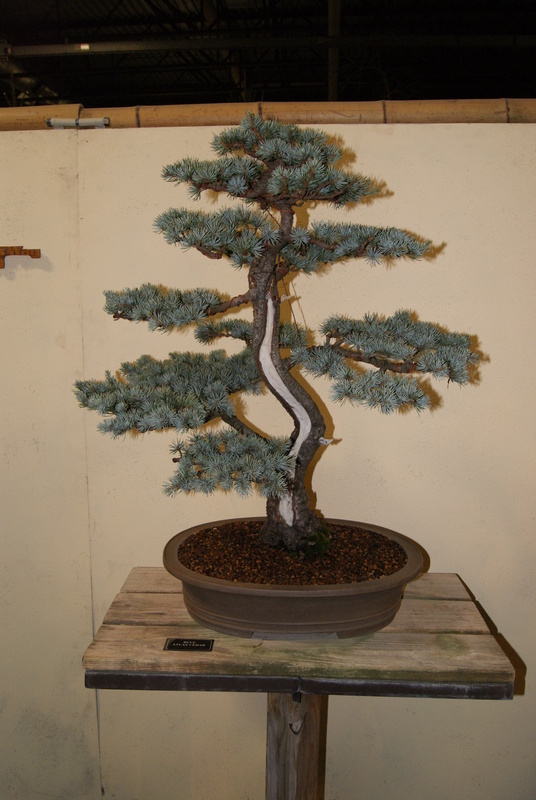 Opposite side entrance panel was displayed with a nice, old, yamadori Ponderosa Pine. 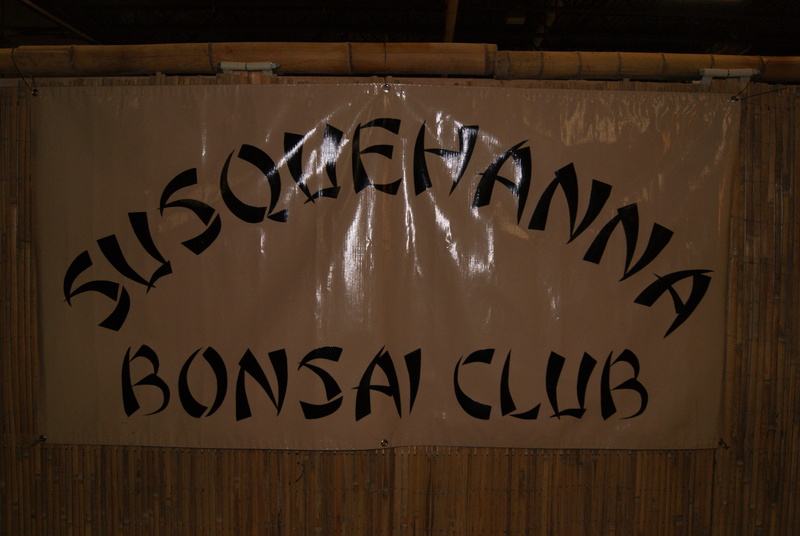 Club banner hanging on side panels. 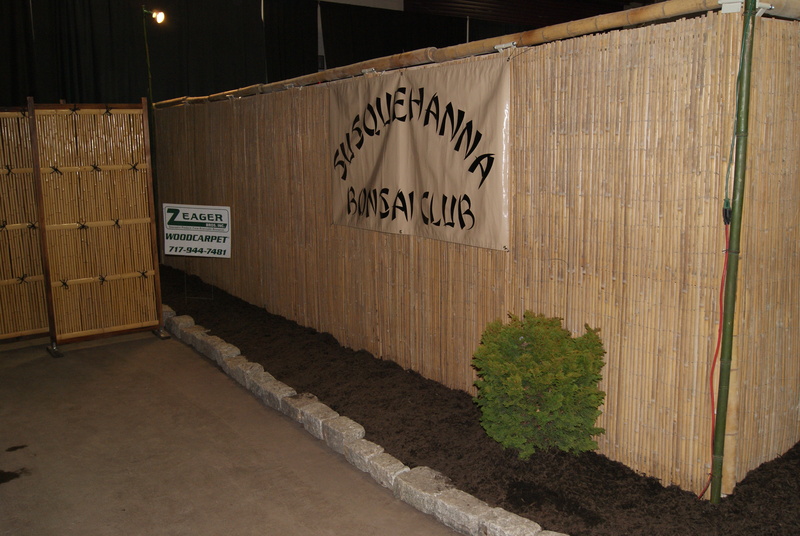 Nice and clean area on side displaying our banner. 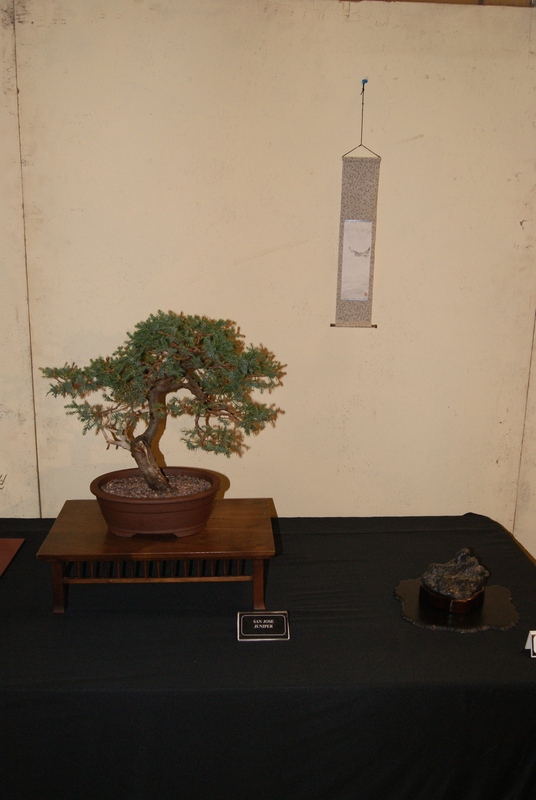 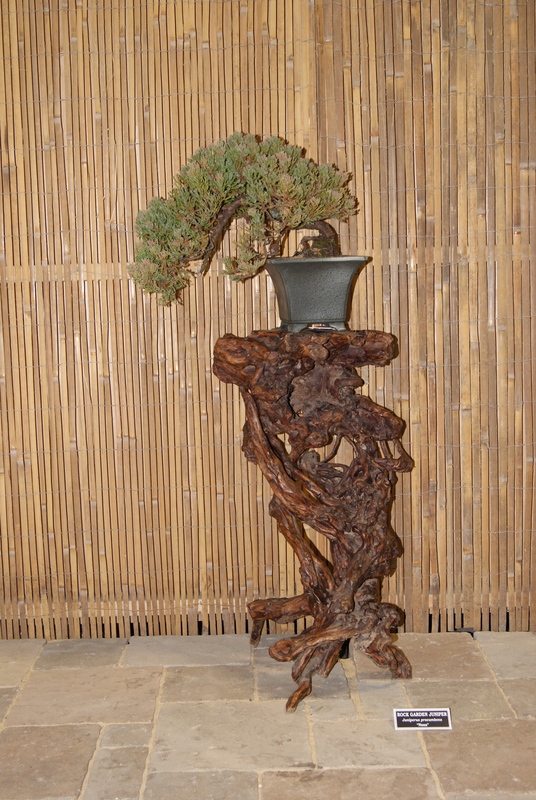 Left side entrance displayed with yamadori Ponderosa Pine, Japanese scroll, lantern and Hinoki Cypress. 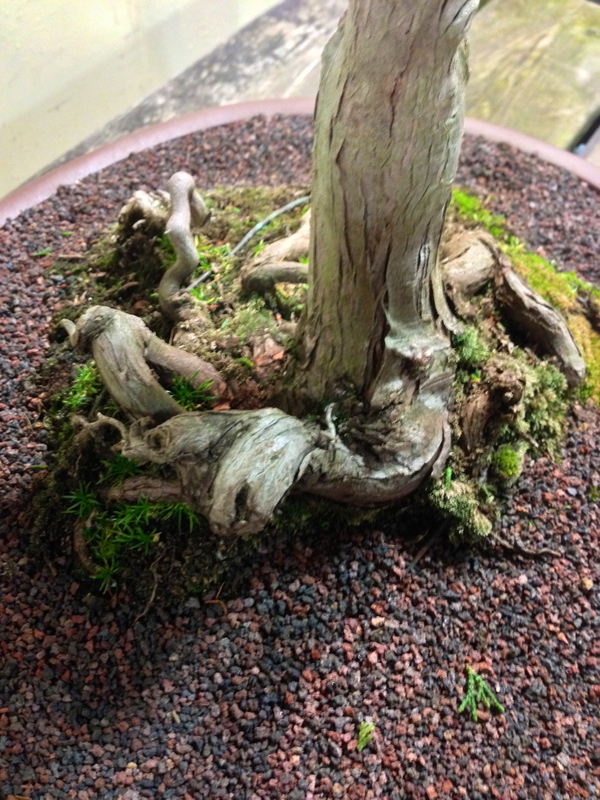 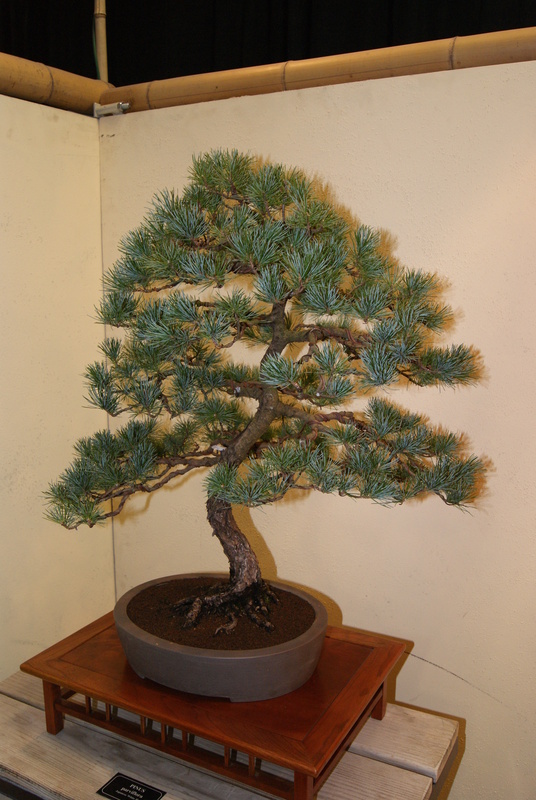 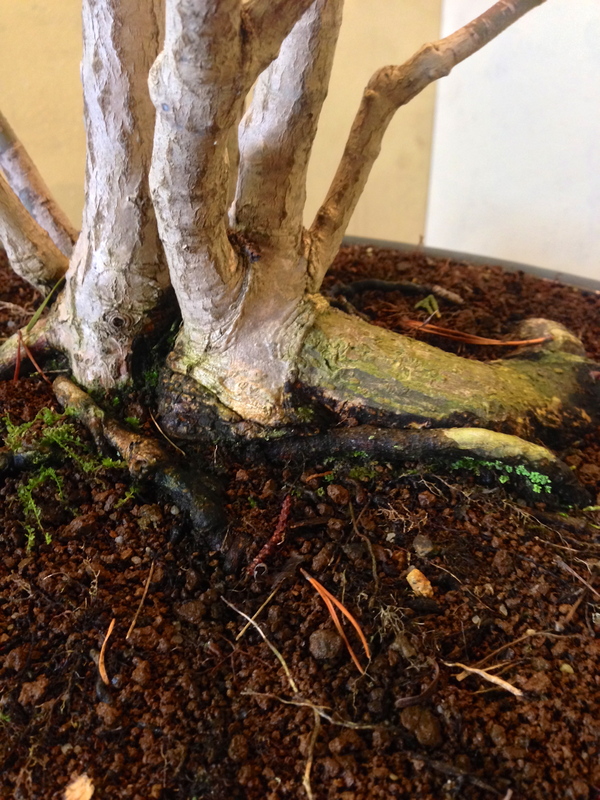 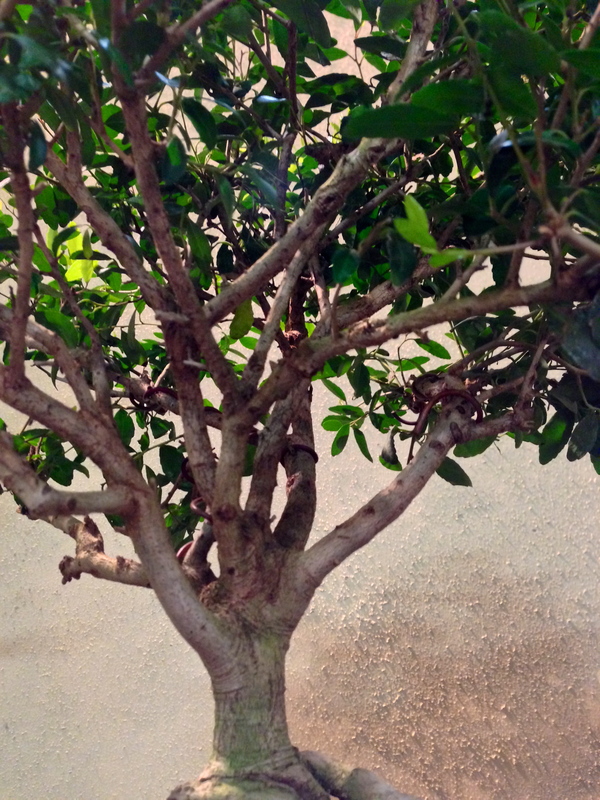 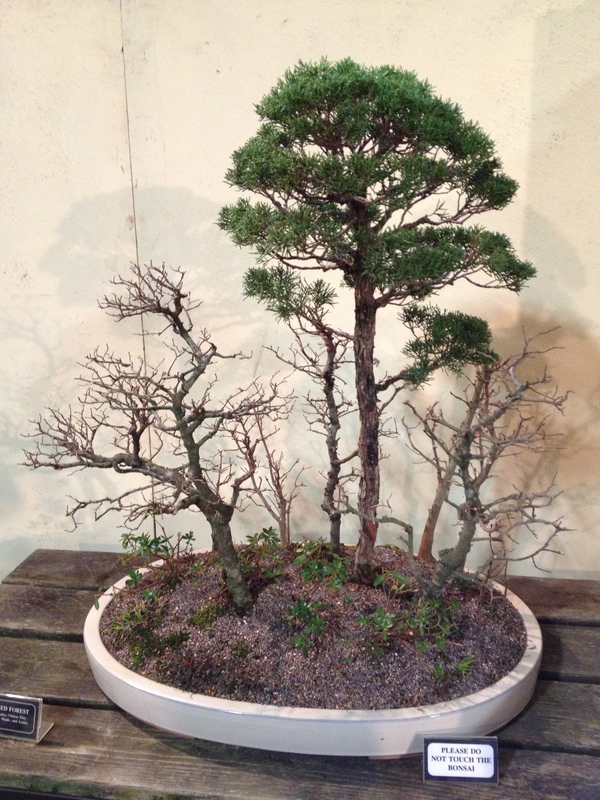 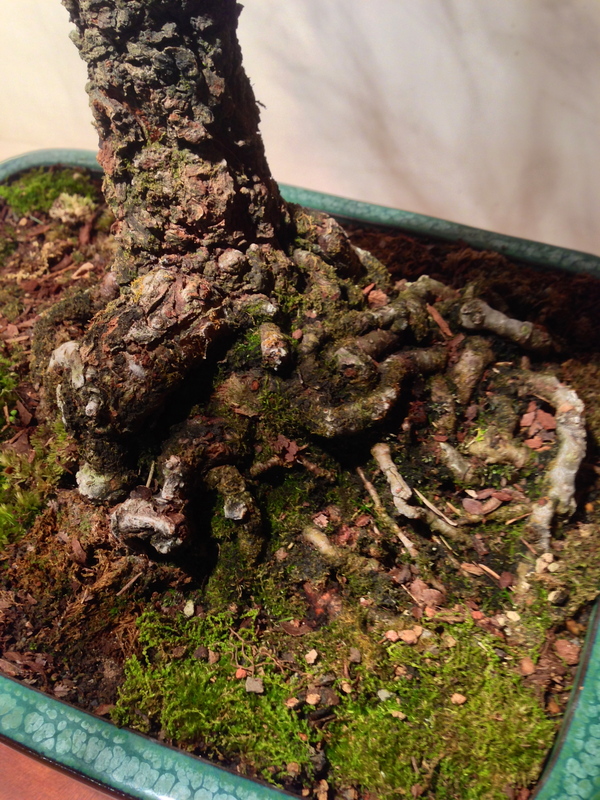 Now we will get into some great bonsai trees. 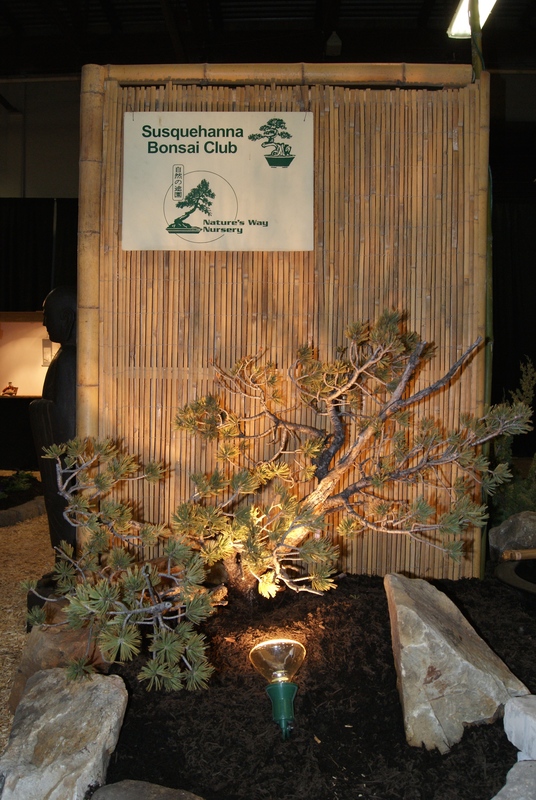 All trees are owned by club members. 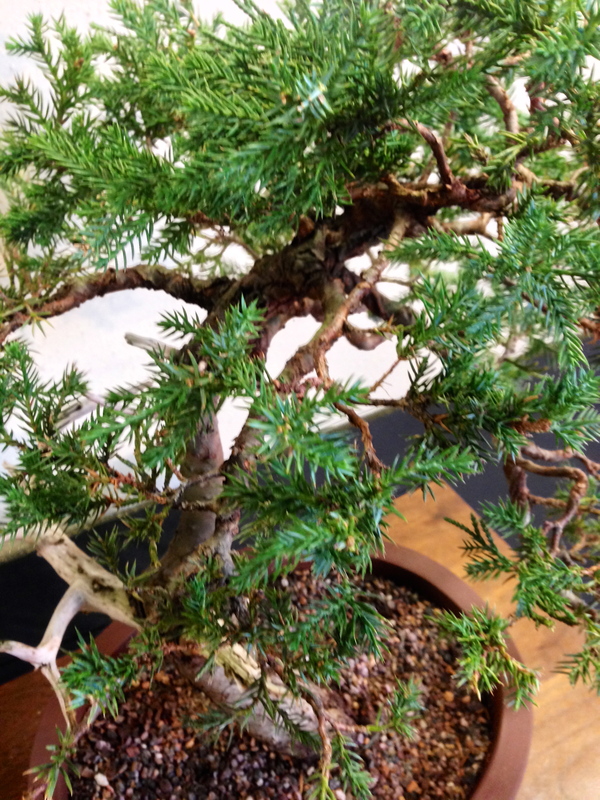 Each set will lead off with a photo of the tree and followed by additional photo(s) of different angles and/or close-ups showing some of the nice details. 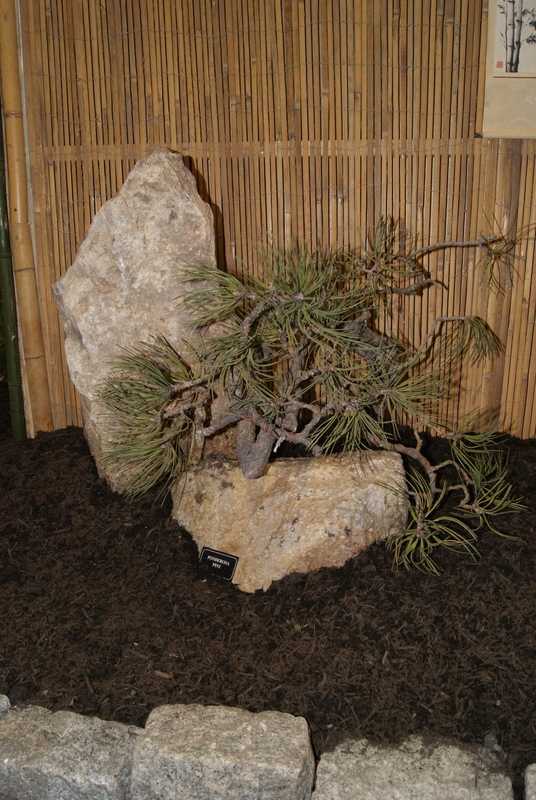 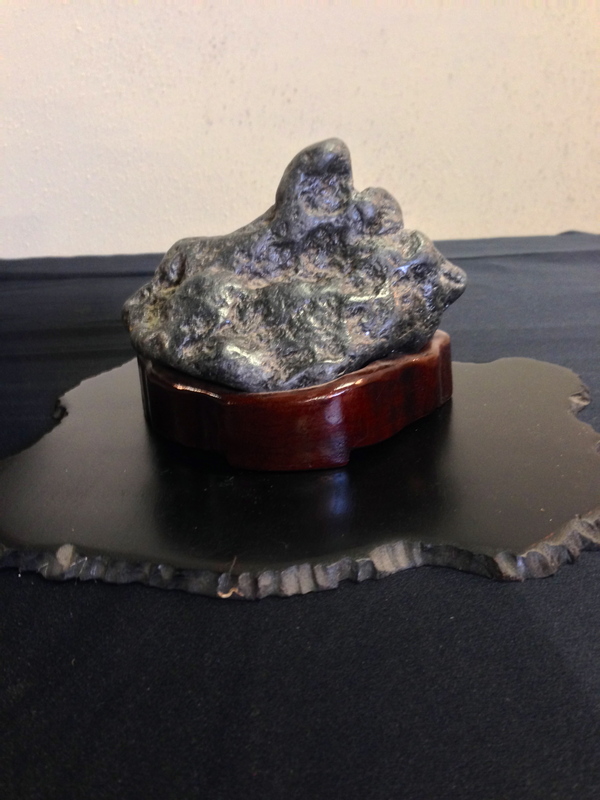 The following photos are of the different accent plants and suiseki (viewing stones) displayed amongst the bonsai and throughout the display area. 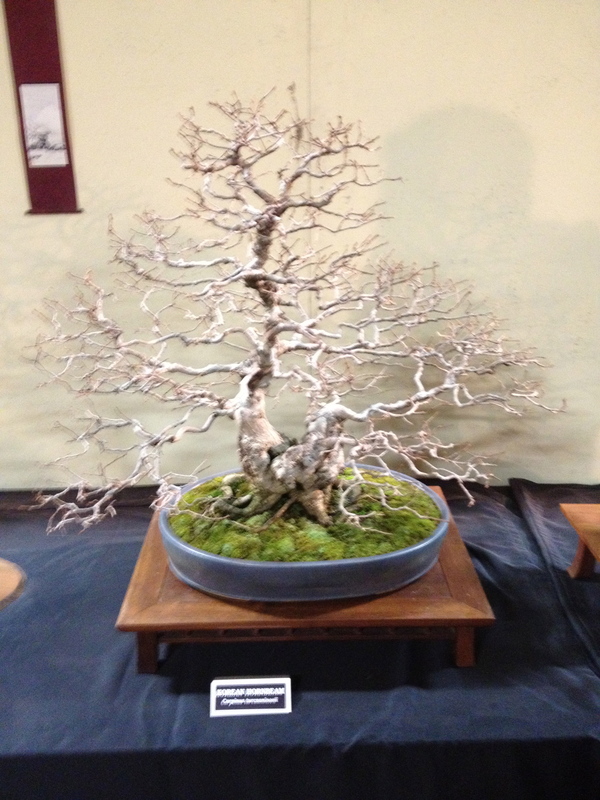 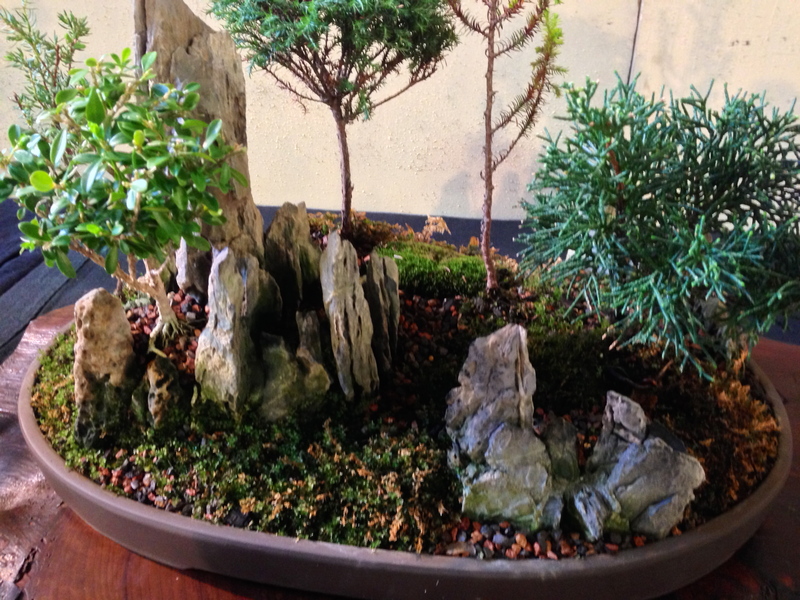 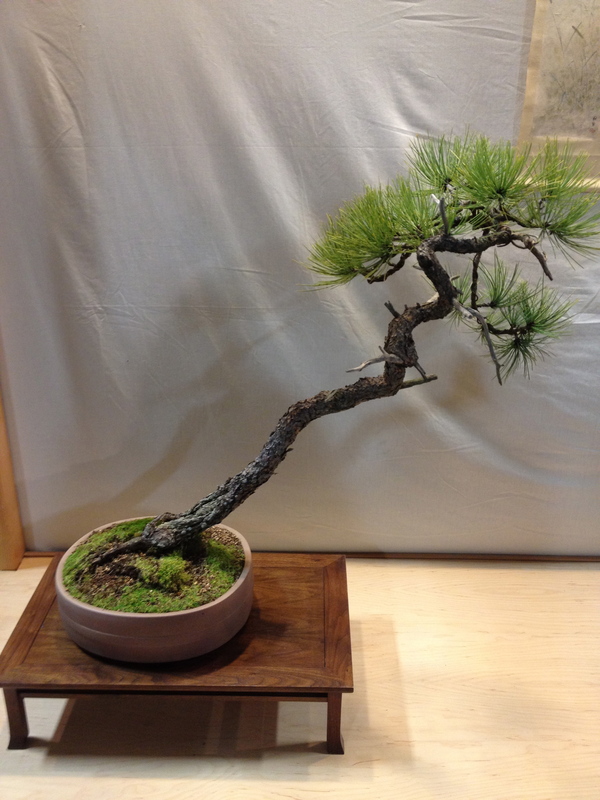 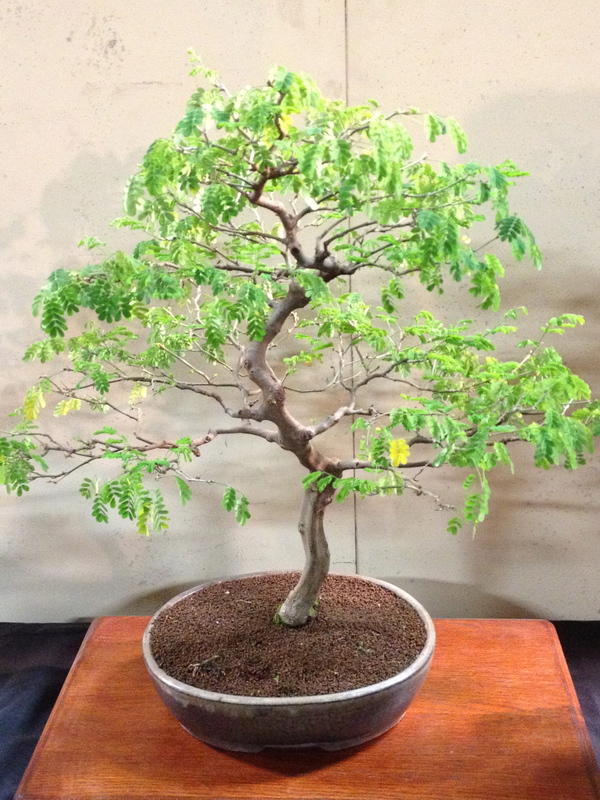 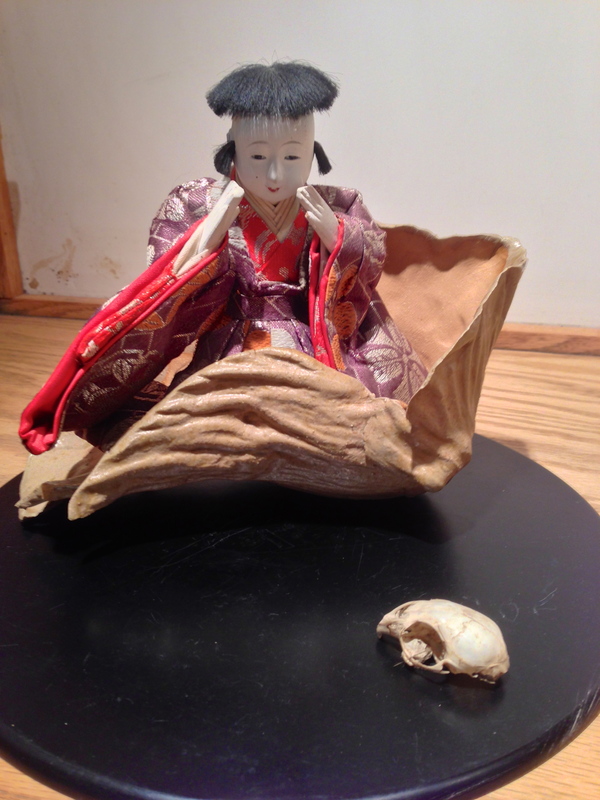 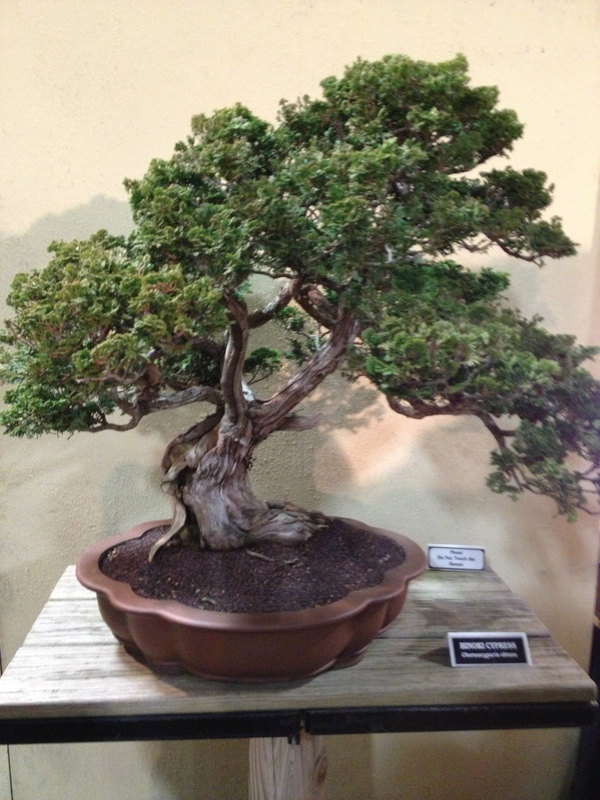 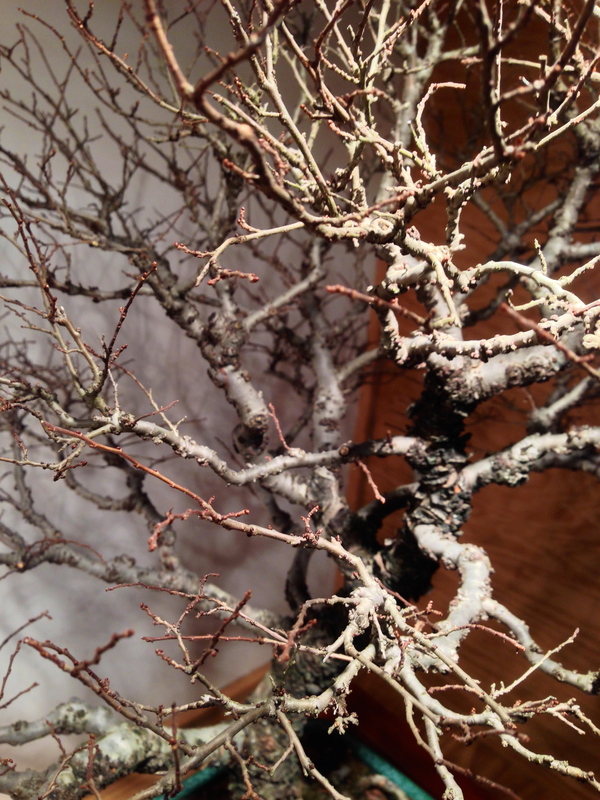 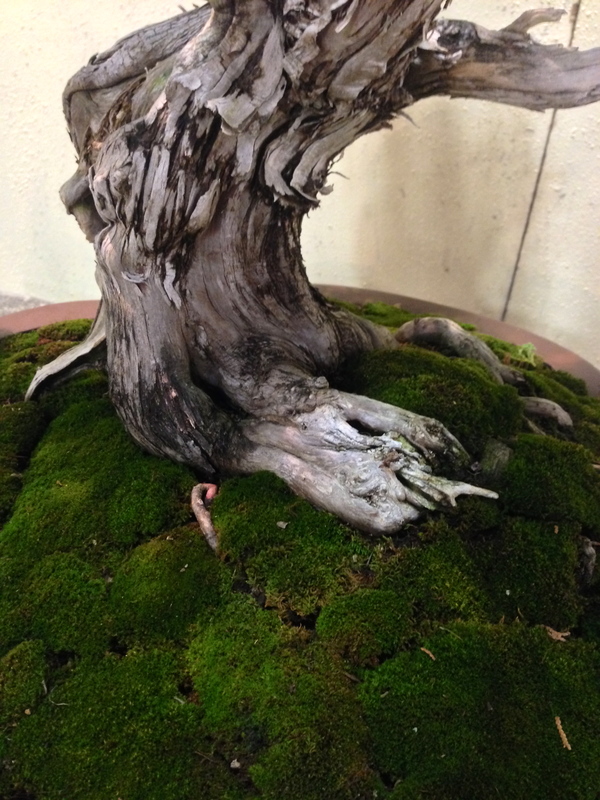 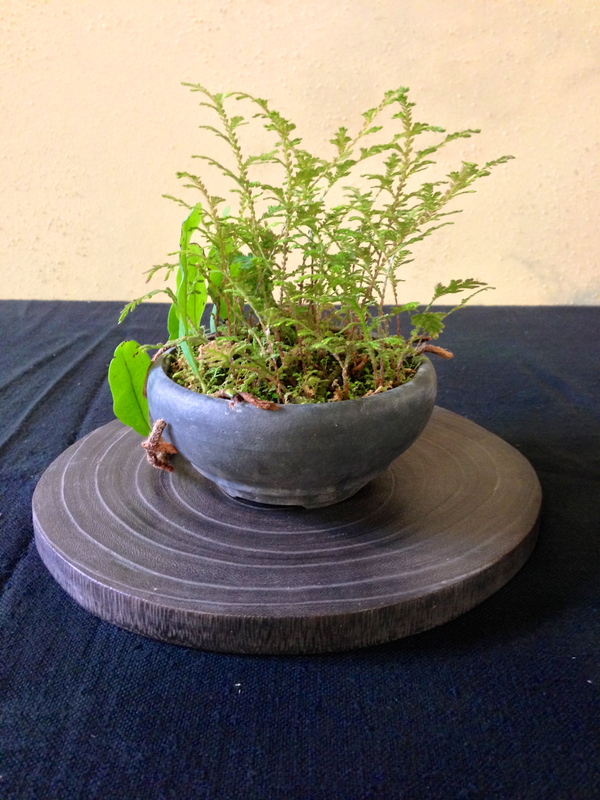 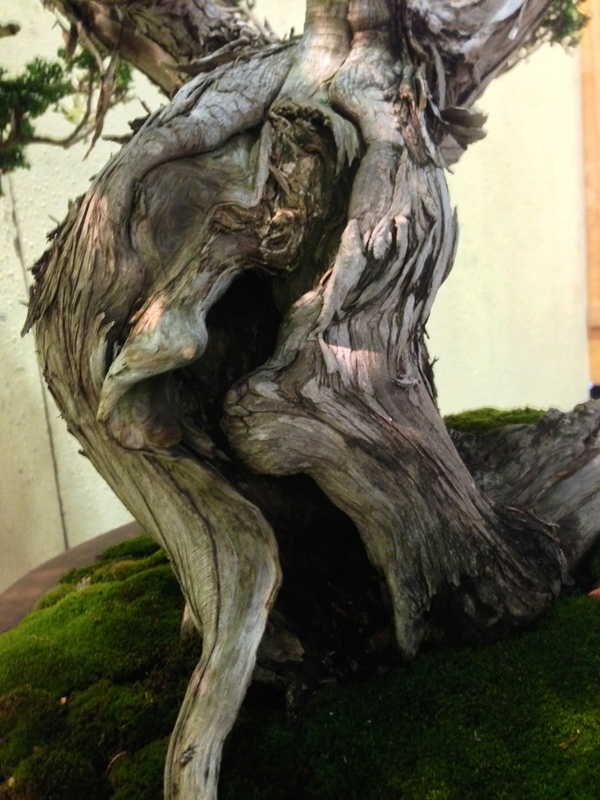 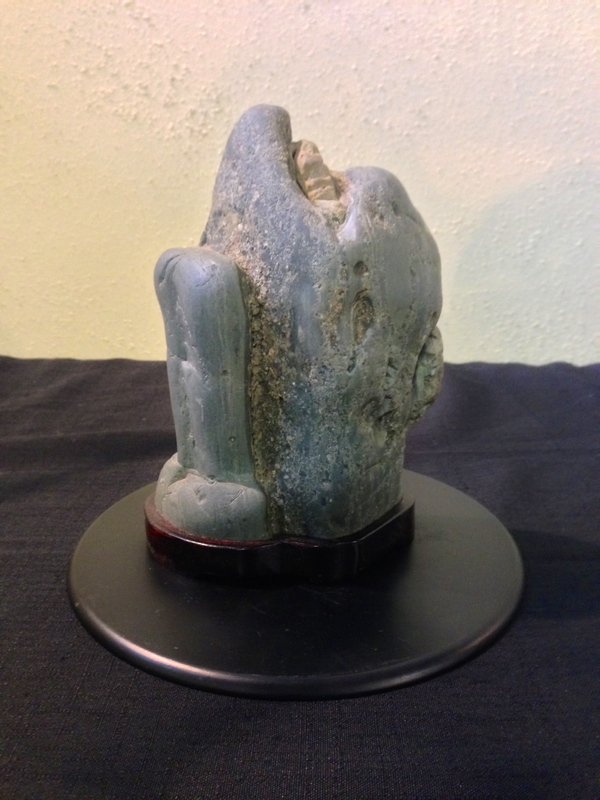 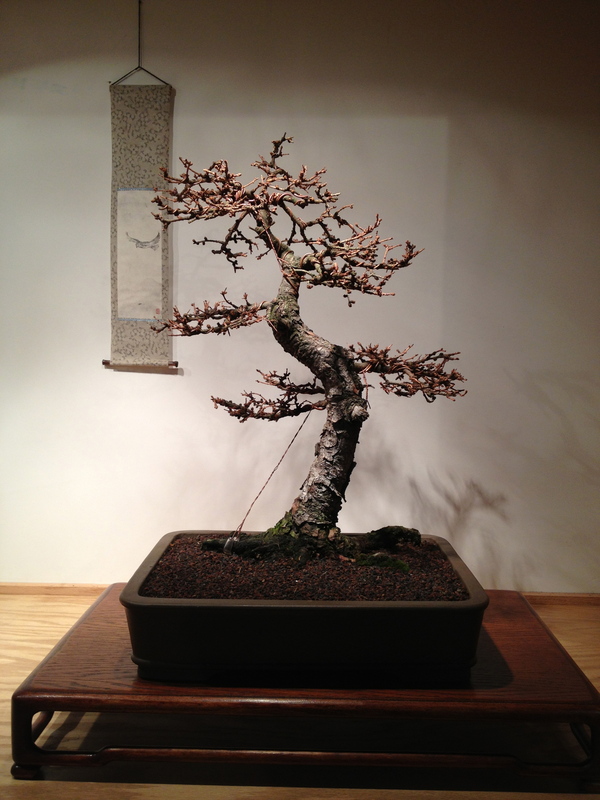 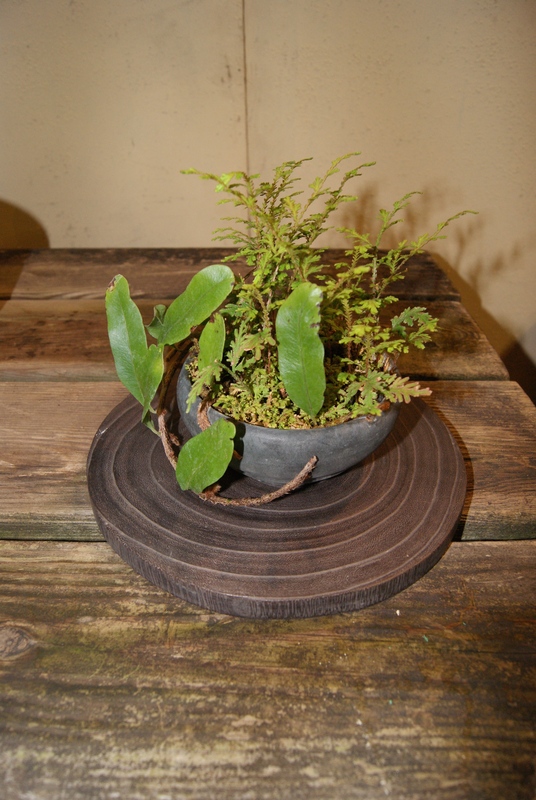 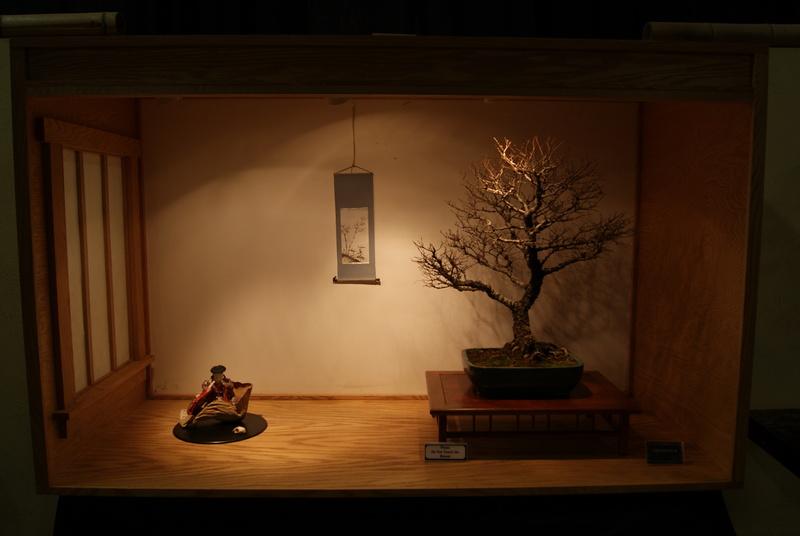 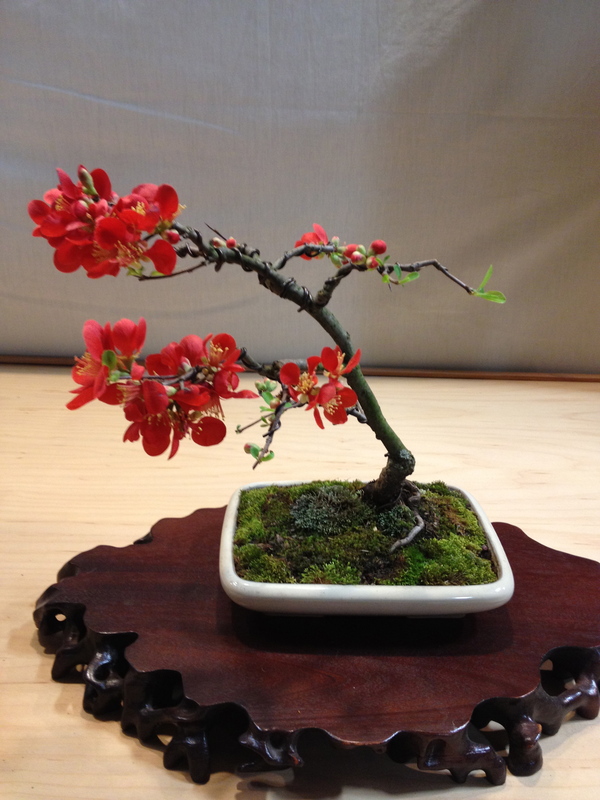 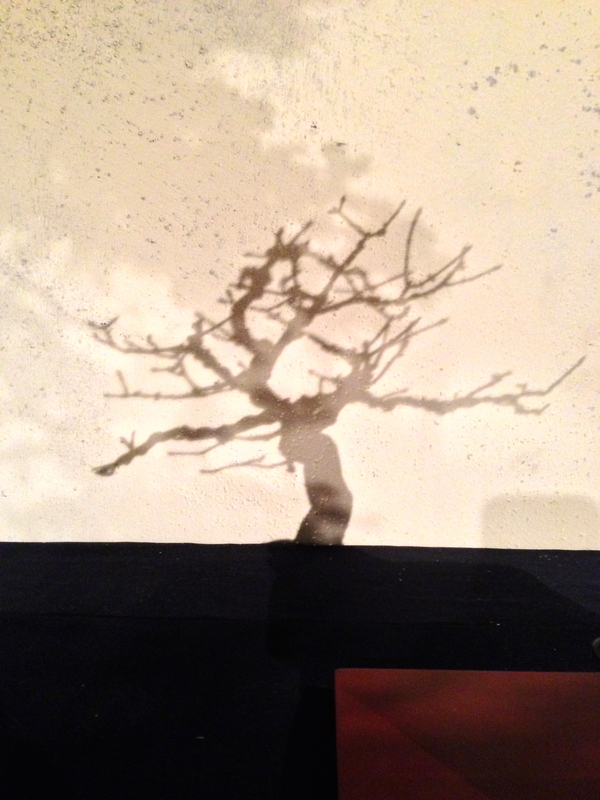 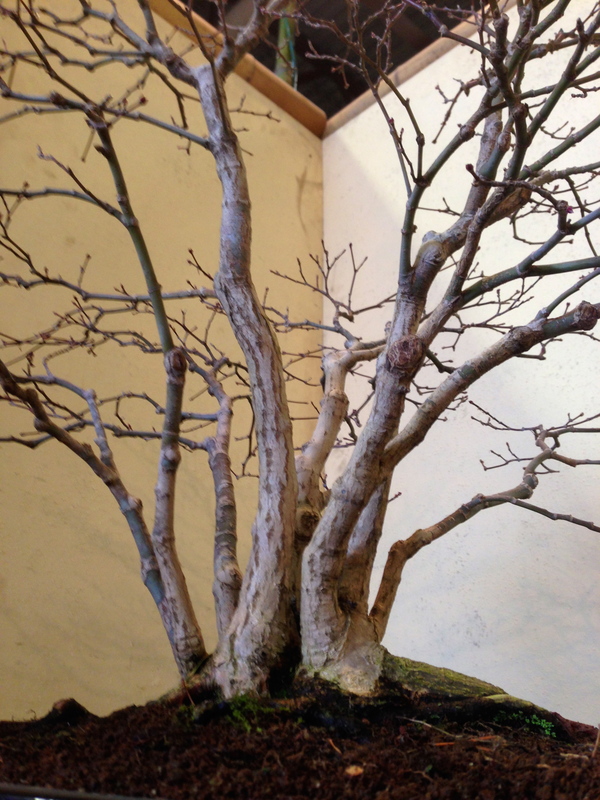 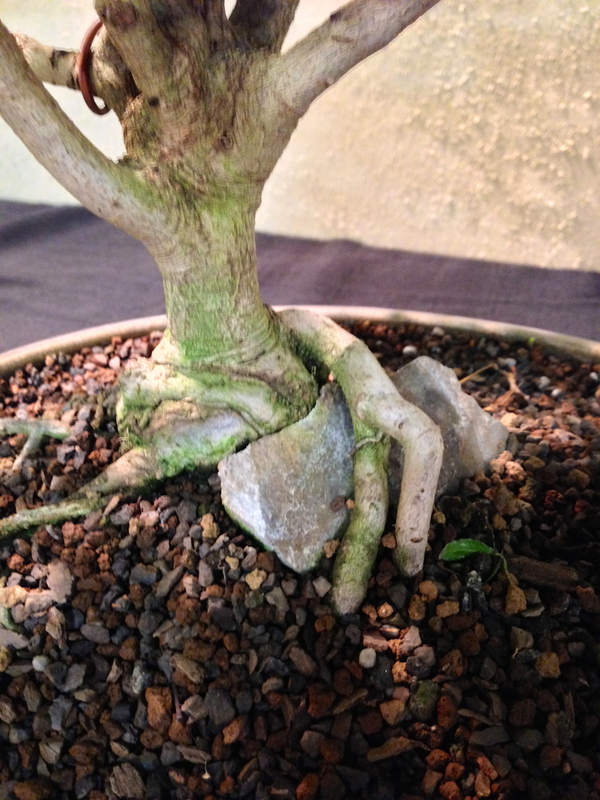 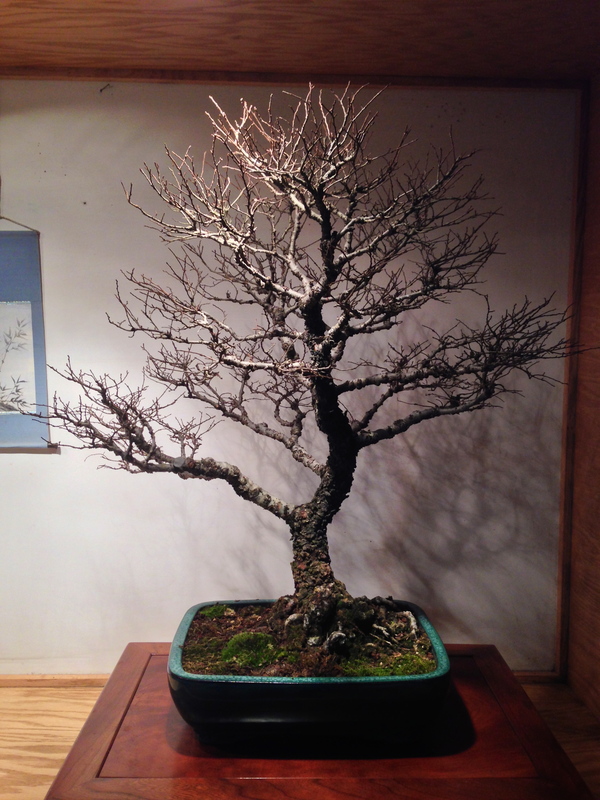 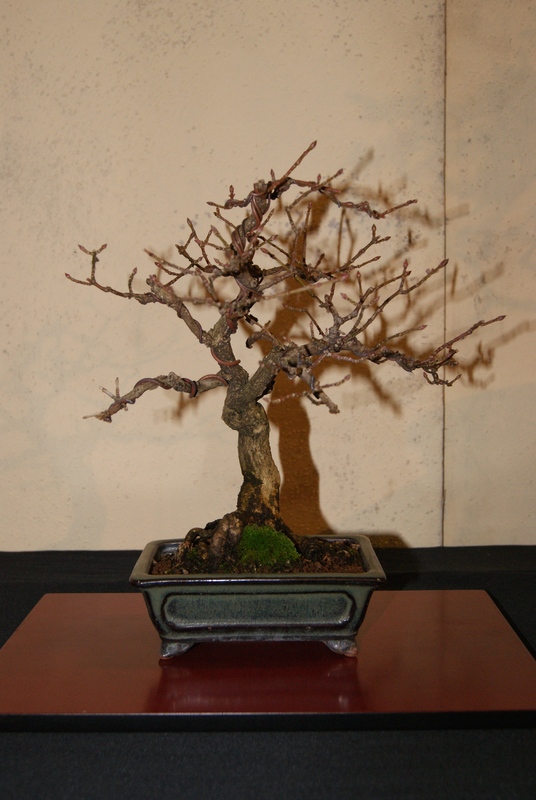 This was displayed with the chinese elm in the tokonoma. 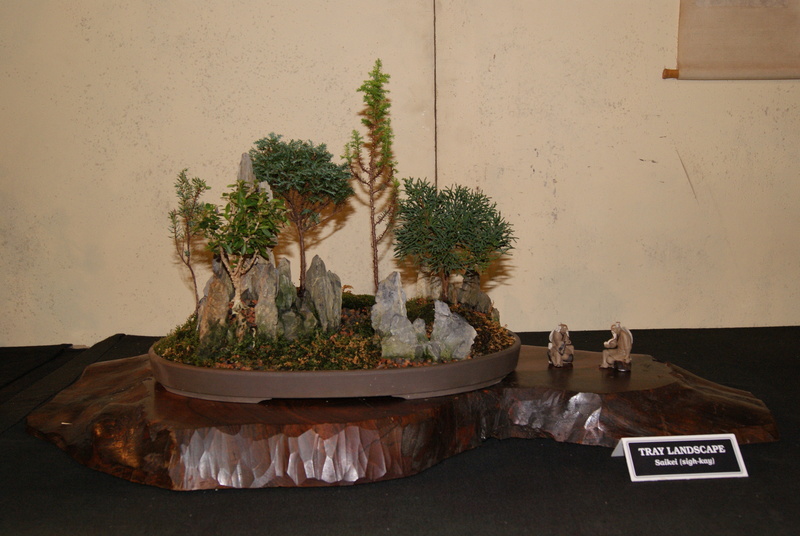 Every so often during the show they would turn off all the lights so everyone could see all the different landscapes set-up and the lights they used. 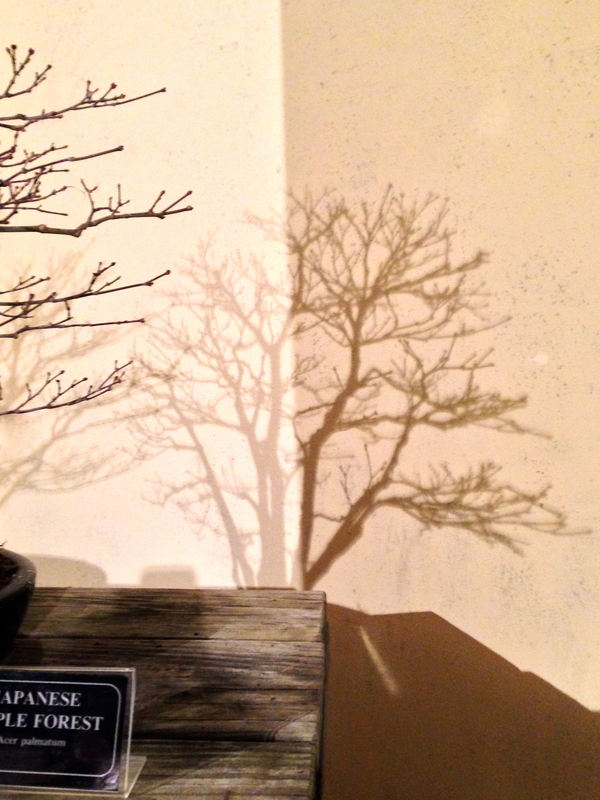 It was actually an amazing few moments to see how all the amazing landscapes would look during the night. 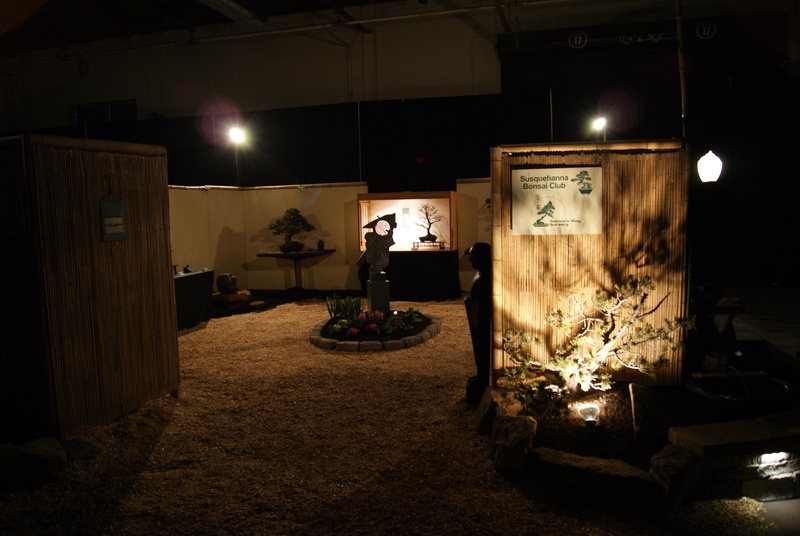 For our display, we had a few soft glow lights that would give our display and the bonsai trees a warm evening feeling. 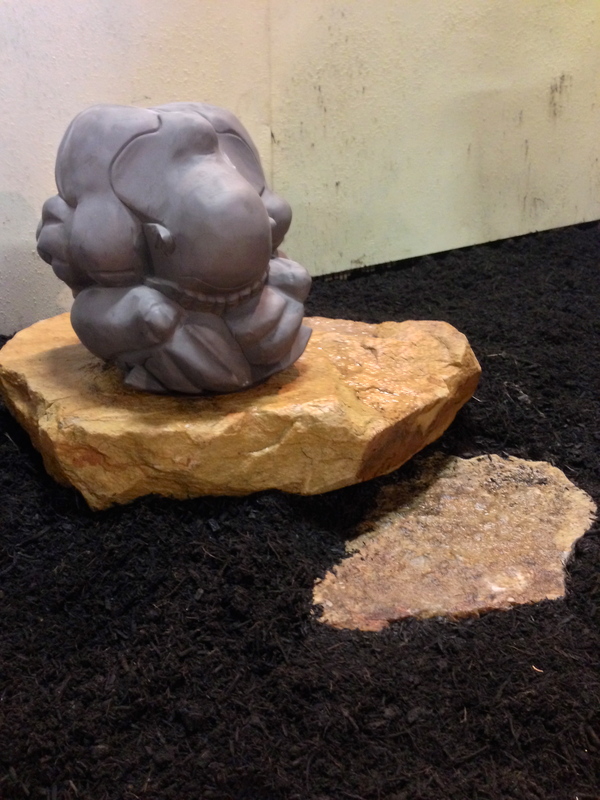 To wrap up the show, we will end this post with a warm, peaceful nighttime glow of our tokonoma. 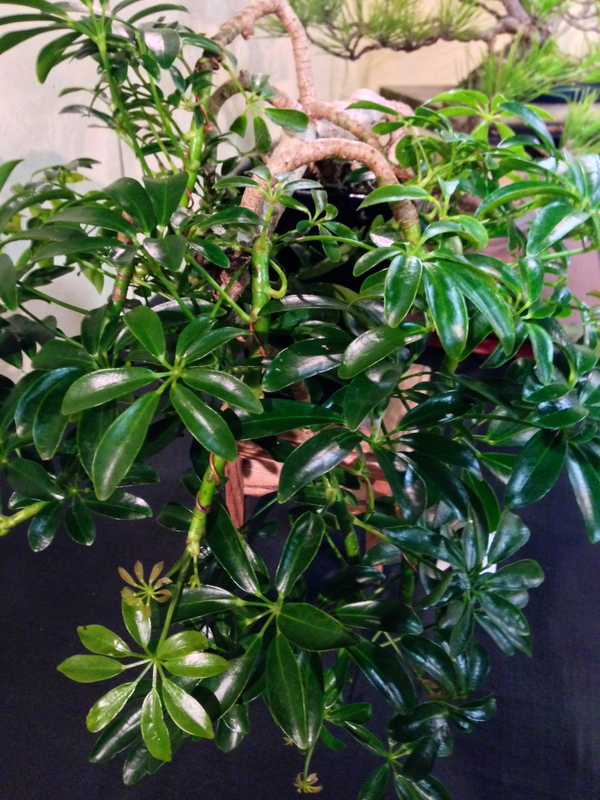 Hope you enjoyed this post! 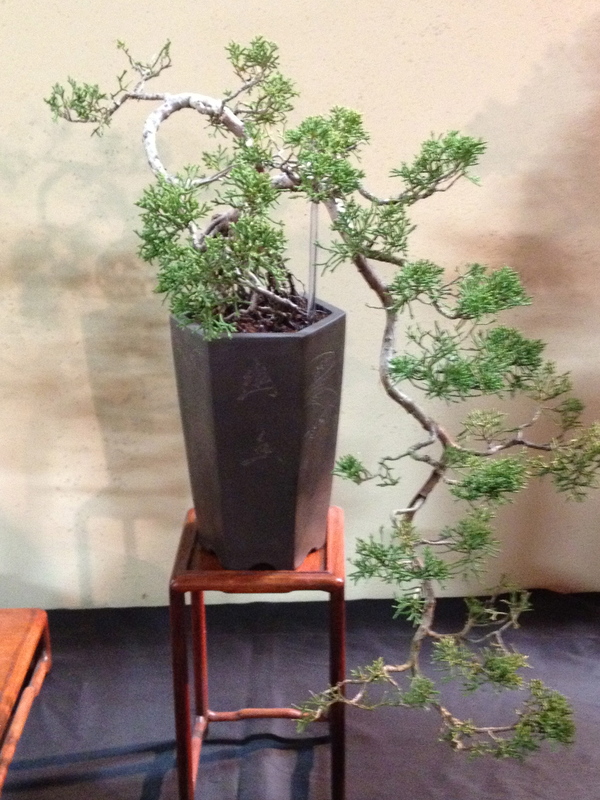 Please check back regularly to view any newly added post or simply sign up to receive each post by email. 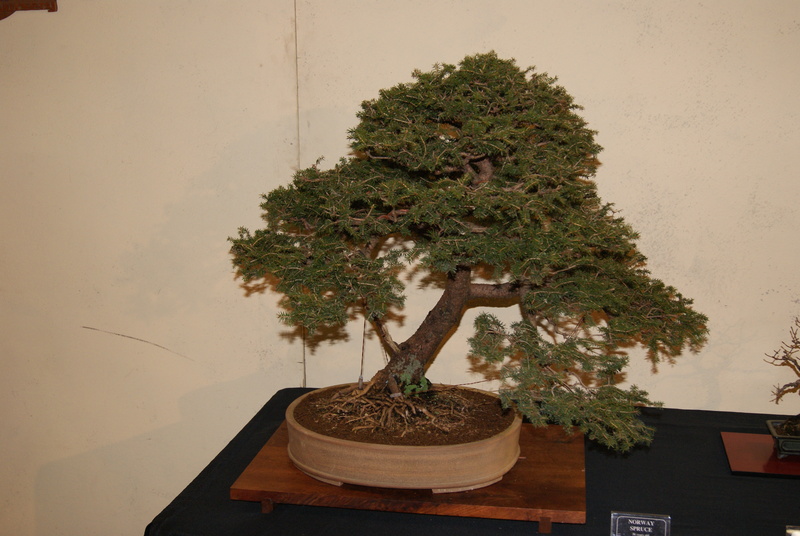 Also please check our upcoming events page often as if times and dates change, they will be noted there and at the bottom will be the date of the latest update so you know if anything has changed.